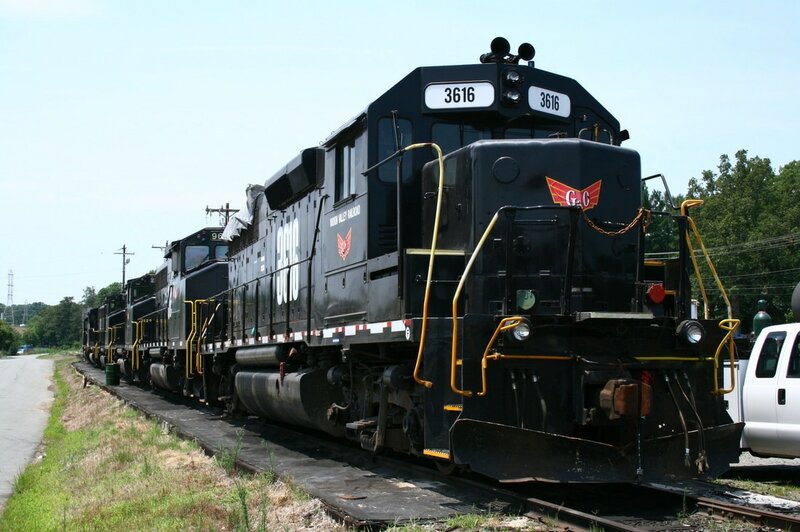 The Yadkin Valley Railroad (YVRR), it could be said, is an amalgam of two different railroad lineages. Two distinct branches, different in topography as well as the early heritage, define this independent railroad. Running through the foothills of North Carolina, one leg of the railroad moves west to the fringe of east slope of the Blue Ridge Mountain range at North Wilkesboro; the other, extending north parallel with the same slope and within a stone’s throw of the Virginia border at Mount Airy. True to the North Carolina textile heritage, the early history predating the YVRR was exemplified by this industry in locations such as North Wilkesboro, Elkin, and Mount Airy. Supplementing this was business related to furniture manufacturing, granite excavation, tobacco, and other aspects of agriculture. 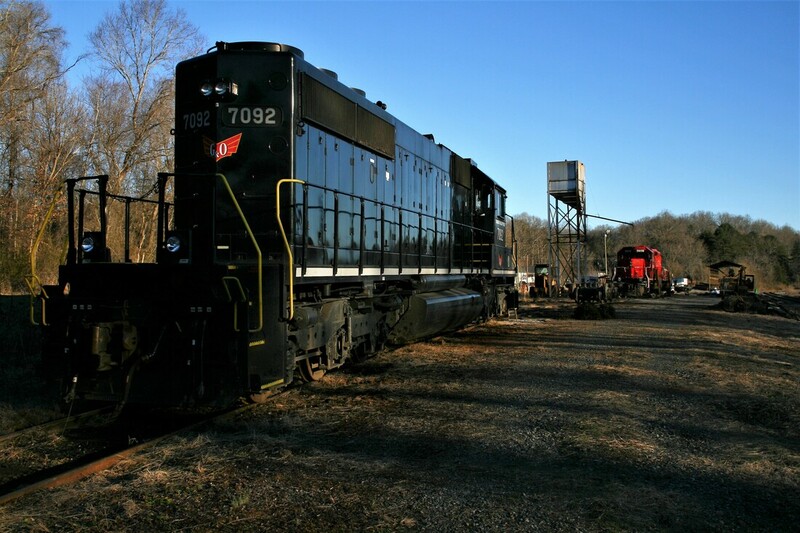 This piece will only feature the contemporary Yadkin Valley Railroad but also examine its predecessor past dating to a century ago. 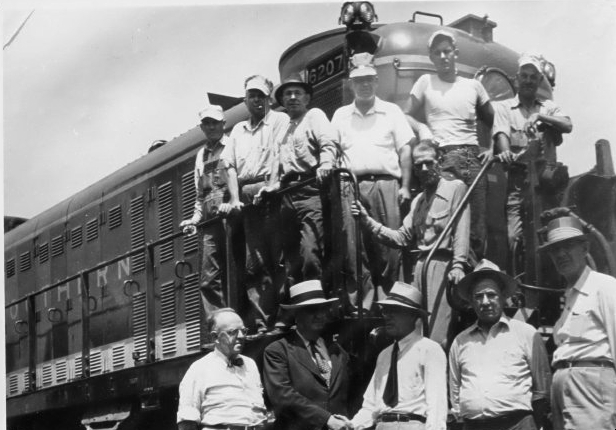 At its core, the story of the Yadkin Valley Railroad is a positive one. It is an example of successful marketing rejuvenating a withering railroad of which its traditional shippers had vanished but replaced with new ones. 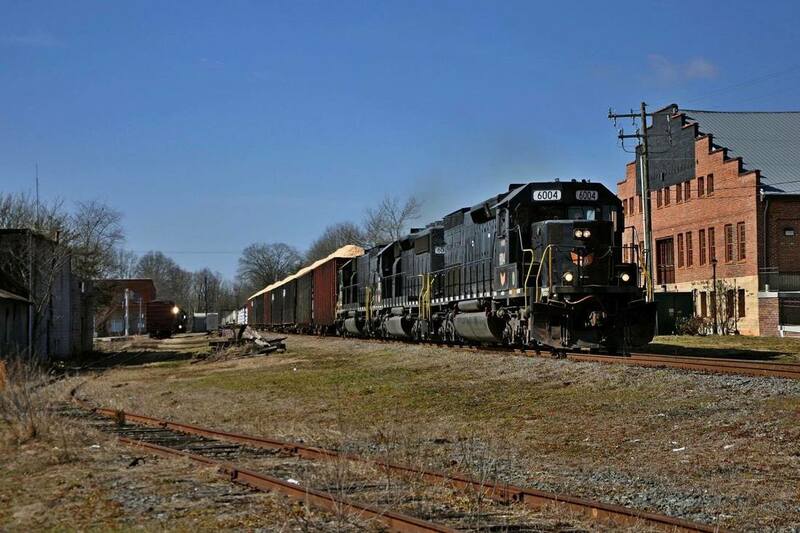 The older businesses that once populated the former Southern and A&Y lines extending to North Wilkesboro and Mount Airy steadily perished in a transforming economy with remaining ones opting to ship by truck. By contrast, the shippers of the YVRR era are relatively modern and of considerably high volume. 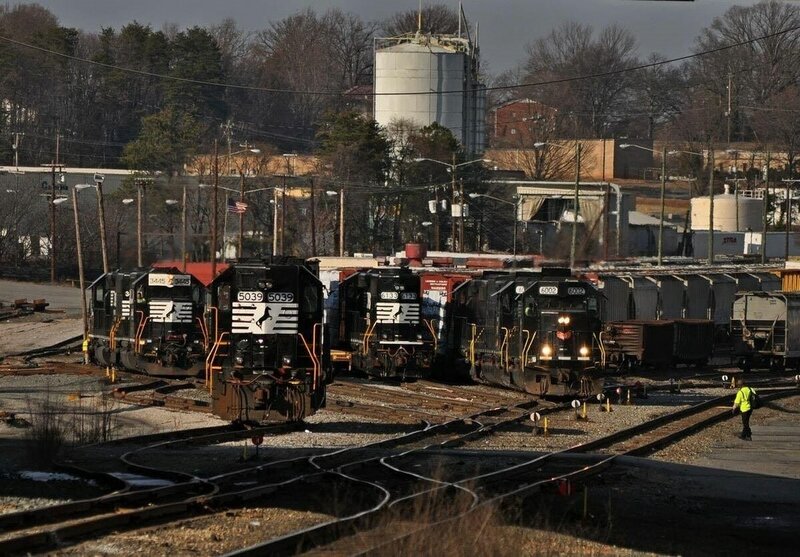 The potential also exists for building upon this customer base as there are vacant sites available--of note, the end point locations of Mount Airy and the hopeful return of active railroad in the city of North Wilkesboro. 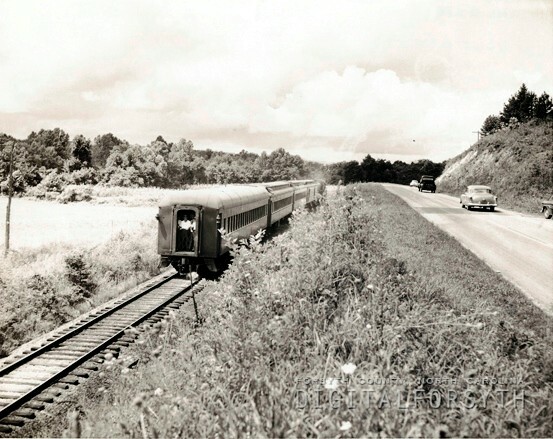 The Cape Fear and Yadkin Valley Railroad was an ambitious undertaking to connect the southern slopes of the Blue Ridge Mountains with the Atlantic coast. Chartered in 1883, the railroad was quickly reorganized as the Cape Fear and Yadkin Valley Railway as it emerged from bankruptcy. 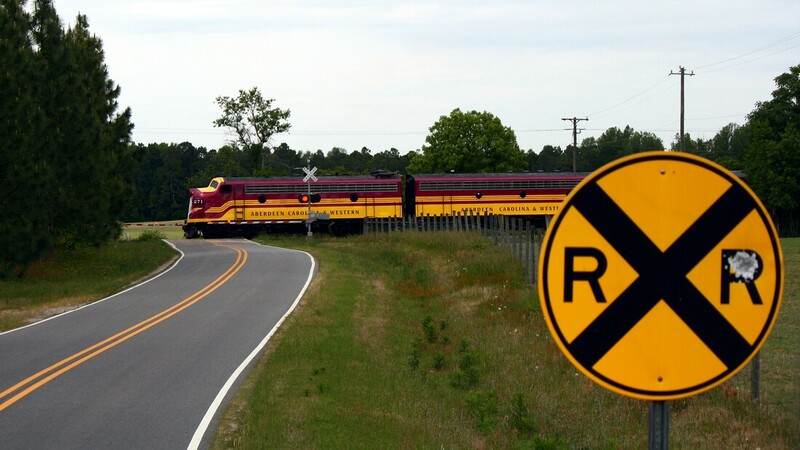 At the outset, an agreement was made with the South Carolina Pacific Railway to connect with its recently graded right of way at the state line. Construction began in 1883 south of Fayetteville, NC to reach the state line and the connection with the SCPR. Soon, simultaneous construction moved in a general northwest direction from Fayetteville reaching Greensboro in 1884. 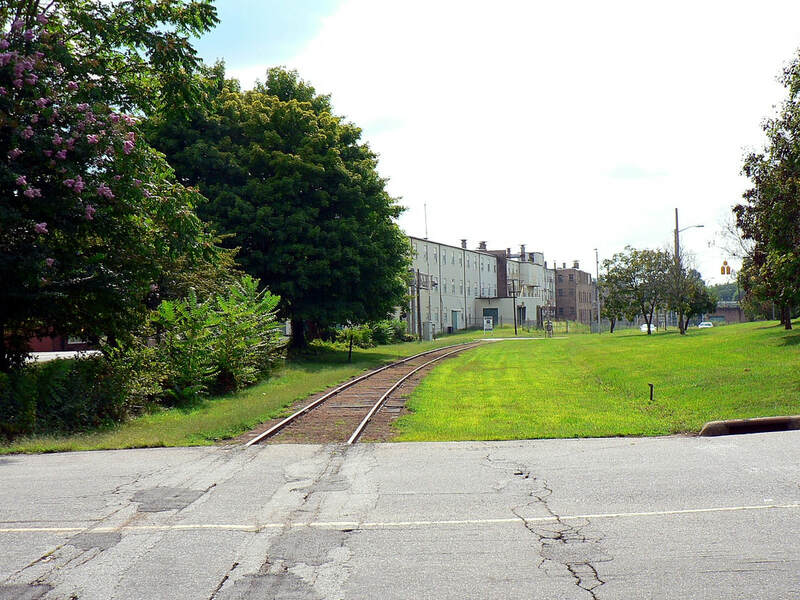 By 1888, the railroad had reached Mount Airy and at its peak, laid rails in the port city of Wilmington in 1890. The rapid development of the railroad exhausted its capital and in 1894, fell into receivership. The CF&YVR had literally built itself into bankruptcy. In a series of legal complexities, the railroad was ultimately divided with the Southern Railway acquiring the northern half and the Atlantic Coast Line the southern sector. 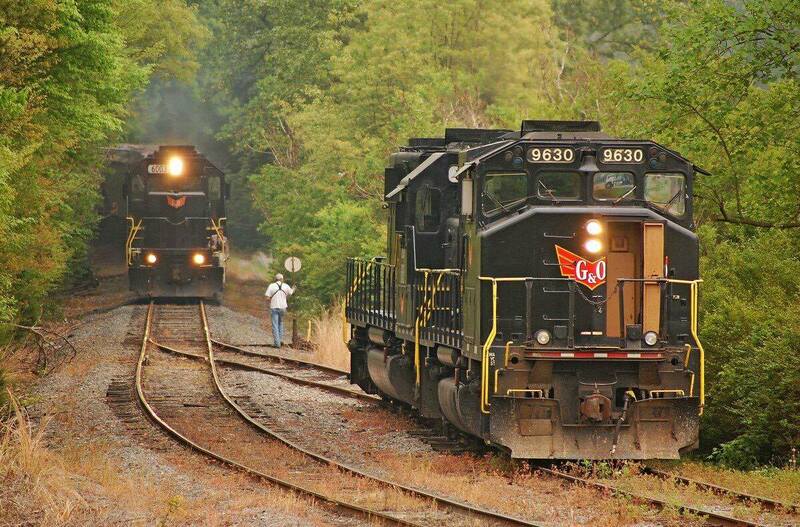 From this division and ensuing legal entanglements was born the Atlantic and Yadkin Railway in 1900. 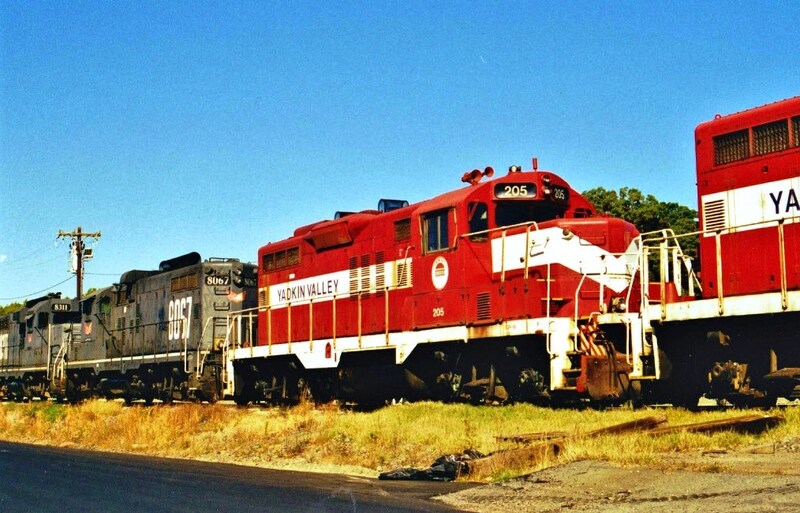 Within the scope of this page concerning the present day Yadkin Valley Railroad, the focus of this A&Y route through Southern Railway ownership will center on the section from Rural Hall to Mount Airy. Railroad construction echoed alongside the cascading shoals of the Yadkin River during the late 1880s in what is now the western stem of the present day Yadkin Valley Railroad. Funded as part of the original Richmond and Danville Railway, the North Western North Carolina Railroad was an extension from Greensboro north through Winston Salem to Rural Hall. 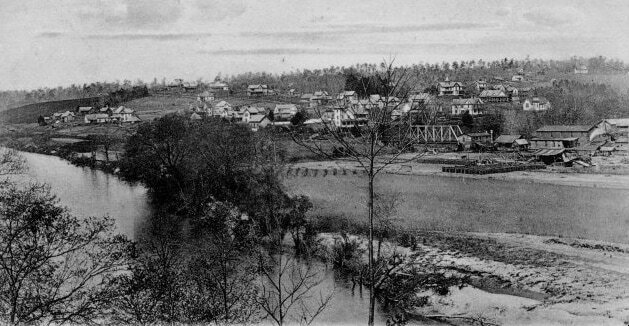 From this point, the railroad turned west along the Yadkin River reaching its terminus at North Wilkesboro in 1890. 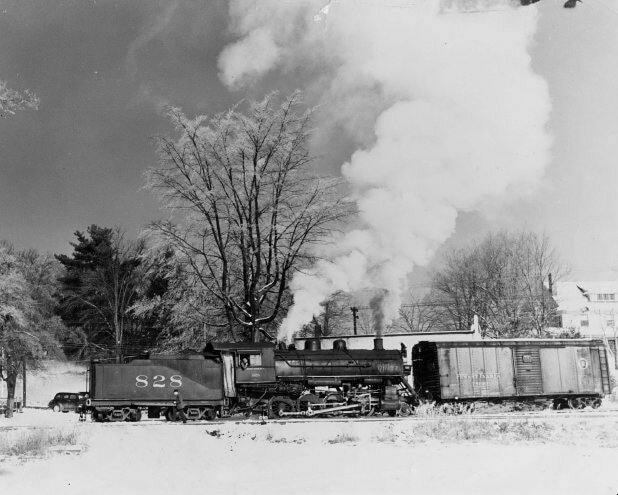 In 1894, the Richmond and Danville Railway was absorbed as a core of what was to become the Southern Railway and in addition, its prior holdings which included the railroad from Greensboro to North Wilkesboro. 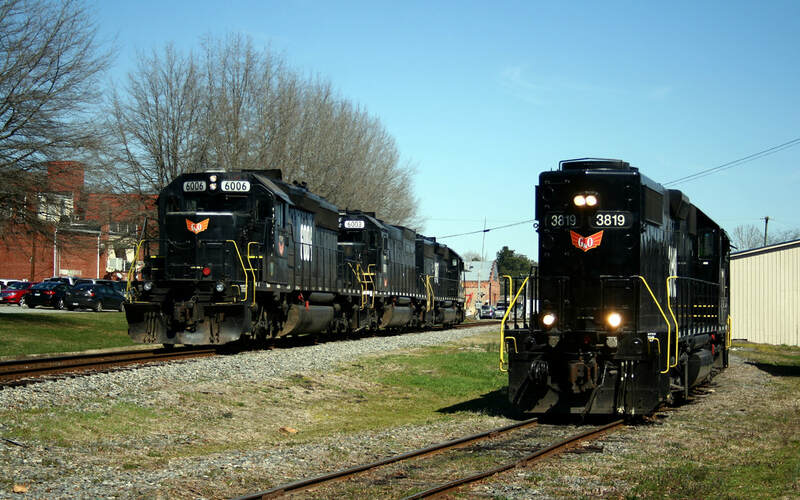 With the subsequent acquisition of the A&Y in 1900, the Southern Railway became the owner of both routes comprising the Yadkin Valley Railroad of today although the A&Y continued to exist as a subsidiary until 1950. 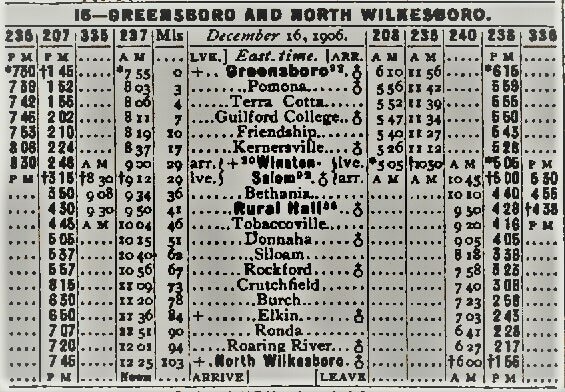 Southern Railway 1906 timetable for the Greensboro to North Wilkesboro route. 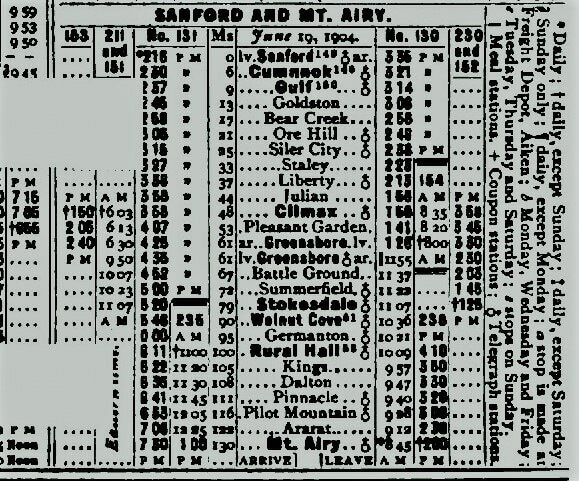 A 1904 passenger timetable for the A&Y between Sanford and Mount Airy. 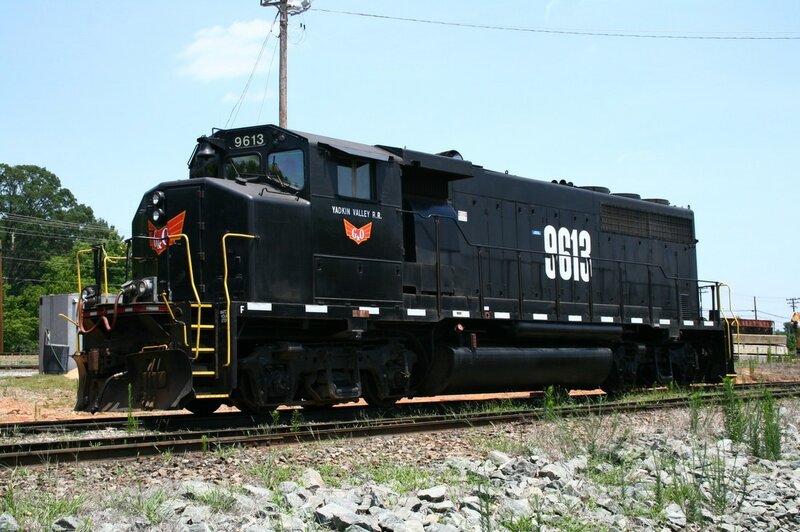 For effectively the first four decades of the 1900s, regular freight and passenger service operated on both the A&Y segment to Mount Airy and the Southern route to North Wilkesboro. 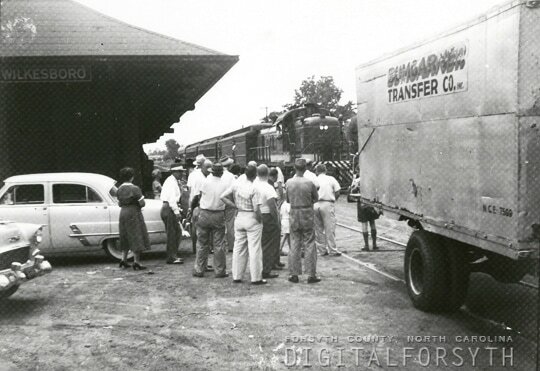 The first significant change occurred when the last passenger train departed Mount Airy on April 29, 1939. Ironically, passenger service would remain on the more rural and less accessible line to North Wilkesboro until 1955. Both regions were predominately agricultural—tobacco and produce—in addition to lumber and poultry with manufacturing bases located at Mount Airy, Elkin, and North Wilkesboro. In the later years of the Southern Railway and into the early Norfolk Southern era, there was diversification of industry developing in these regions. 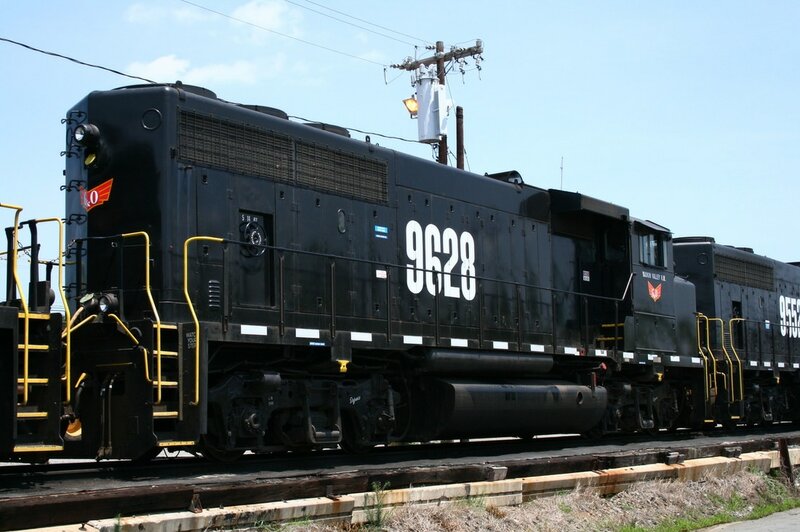 Another notable change occurred during the era of the formation of Norfolk Southern. After the Norfolk and Western and Southern Railways merger, an era of eliminating redundant routes transpired with routes either inferior in online revenue or quality of railroad receiving the axe. 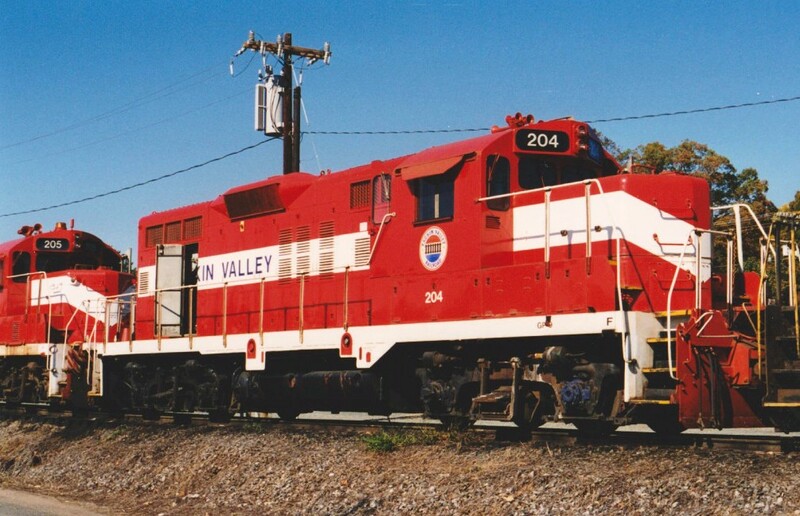 In this instance affecting operations for the Yadkin Valley region, the A&Y route between Greensboro and Rural Hall was eliminated. 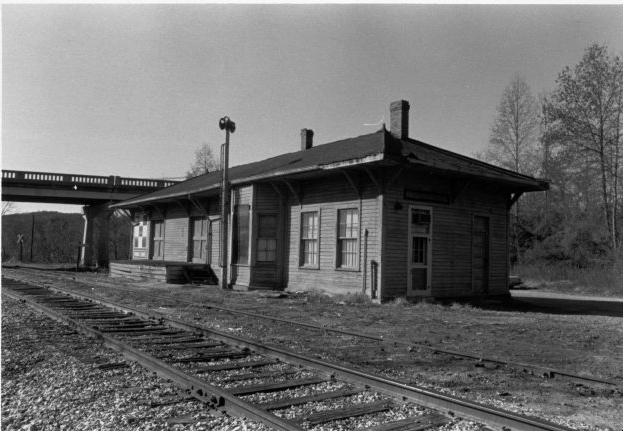 Rail access to Rural Hall now exclusively originated via Winston Salem with its connection through to Greensboro. 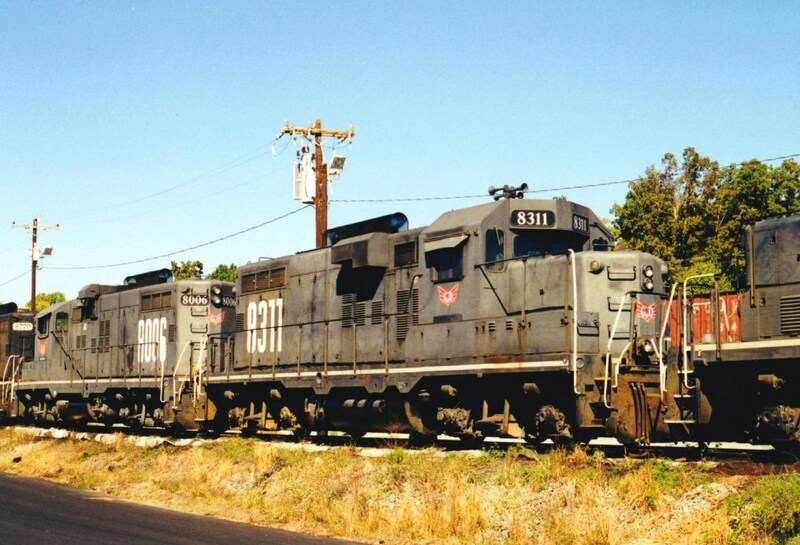 During the 1980s, the major railroads initiated the selling or leasing of secondary and branch lines to independent short line operators as opposed to abandonment. Shedding lines due to maintenance costs and fewer online shippers, large numbers of smaller operators emerged to fill this niche of delivery to the shipper. 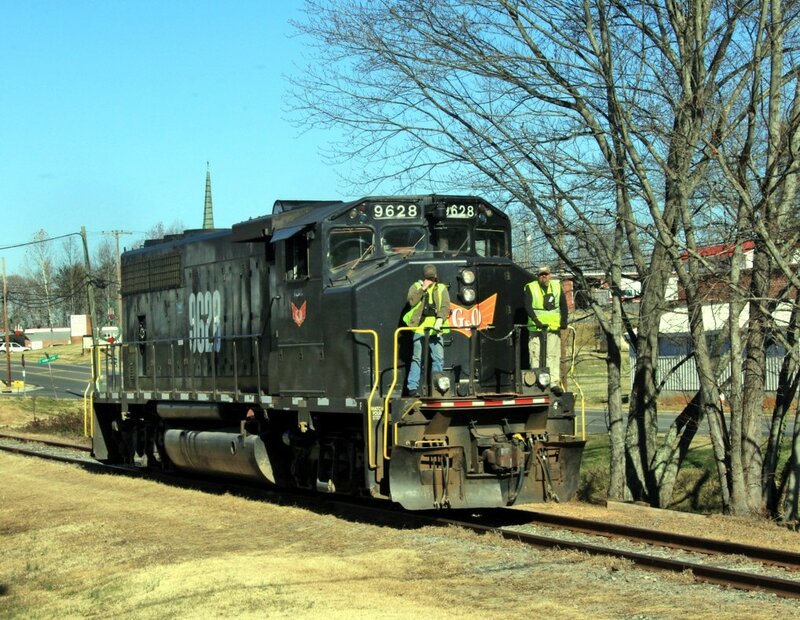 In 1989, the Yadkin Valley Railroad was created—leased from Norfolk Southern—to operate the railroad from Rural Hall extending to points Mount Airy and North Wilkesboro. 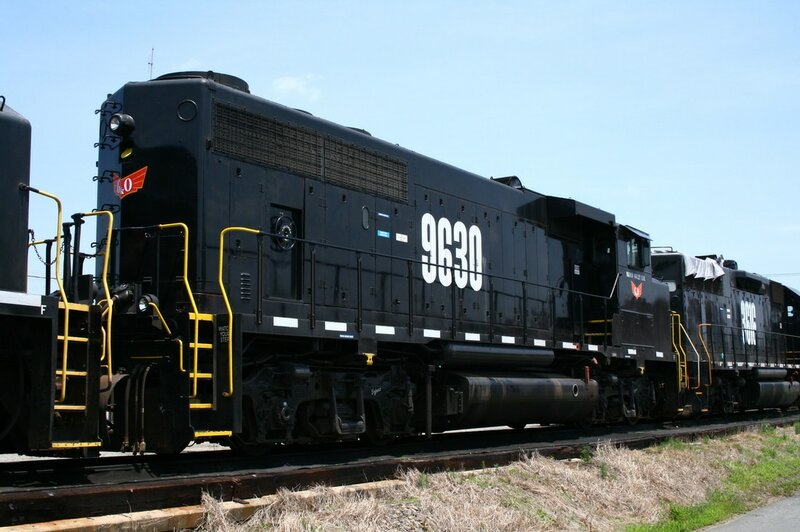 In 1994, Gulf and Ohio took control of the operation leaving intact the Yadkin Valley Railroad name. The YVRR utilizes trackage rights on the NS from Rural Hall and Winston Salem and its power is often visible at the yards in both locations. 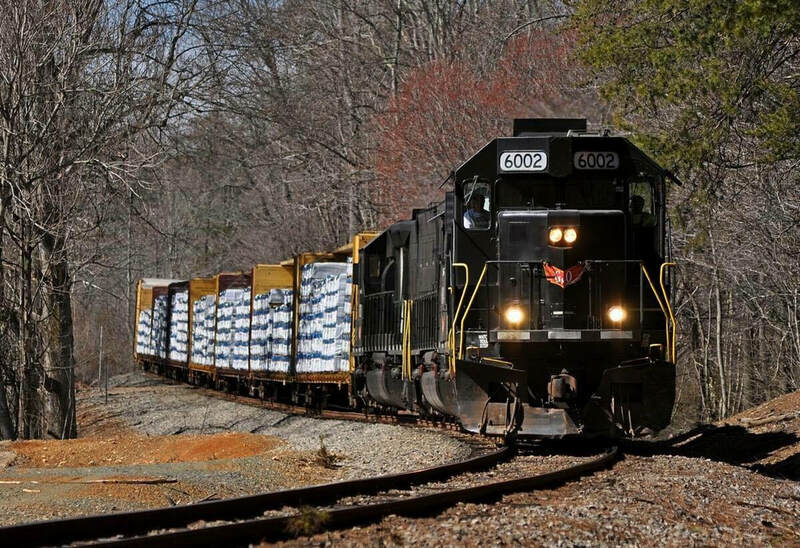 At present, the Yadkin Valley Railroad lists 93 miles of track (30 miles ex A&Y Rural Hall to Mount Airy and 63 miles former Northwest North Carolina RR Rural Hall to North Wilkesboro) The number of shippers is currently sixteen with an annual average of 11,500 carloads. 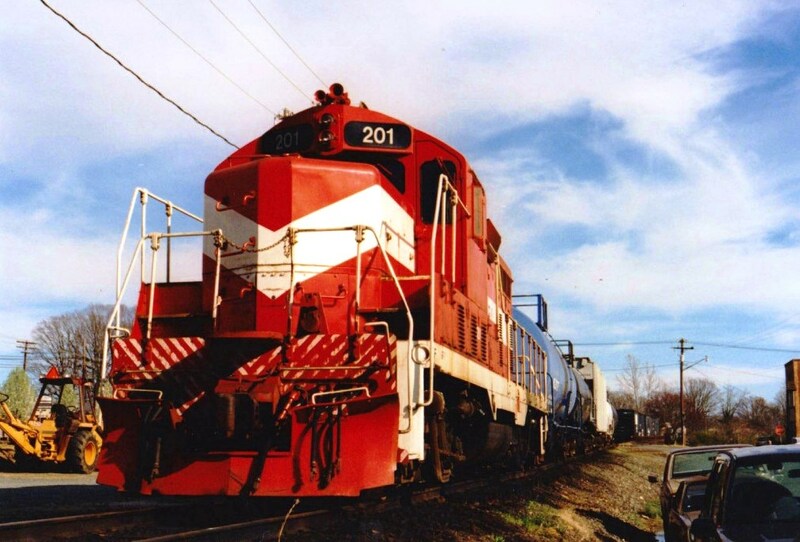 Currently, the YVRR operates with ten locomotives. A condensed operating plan of the Yadkin Valley Railroad would be as follows. There are certainly deviations from this as necessary but it can be used as a general guideline: Each morning the Yadkin Valley Railroad has 2 separate trains that operate between Wilkesboro & Rural Hall. The Elkin Train (ET1) will go on duty around 4AM in Elkin and begin its long day of switching all the industries in the busy corridor between Crutchfield and Roaring River, NC. Since they do very little industry switching, what is considered the "road train" leaves NS North Winston Yard at around 430AM operating under the ID of Yadkin Valley Rural Hall Train (YV1). This is for the westbound run up the Yadkin River towards Wilkesboro. Depending on the work load and the location of the Elkin Train, (ET1). 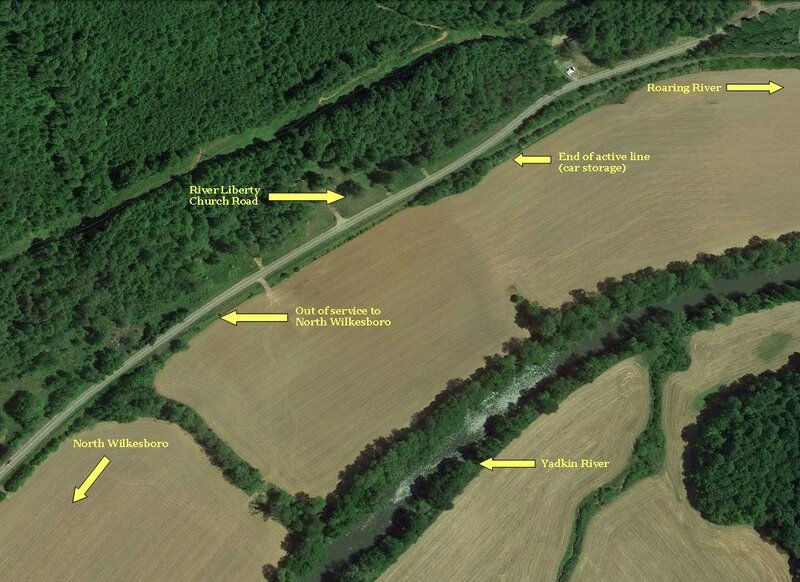 YV1 train will turn in either Burch at the small yard, Elkin at the pass track, or further west in Roaring River. Roaring River was once the everyday turning point of YV1 but since traffic and train length has increased as well as the crew on duty time with the run to and from Winston-Salem the usual turning spot for YV1 is now either Burch or Elkin. ET1 will assemble most of YV2's eastbound tonnage ahead of time at the turning spot for his trip back toward Rural Hall. Around 12PM wherever they make the turn to head back eastbound toward Rural Hall the YV1 crew will swap with a fresh crew and the symbol then becomes YV2. 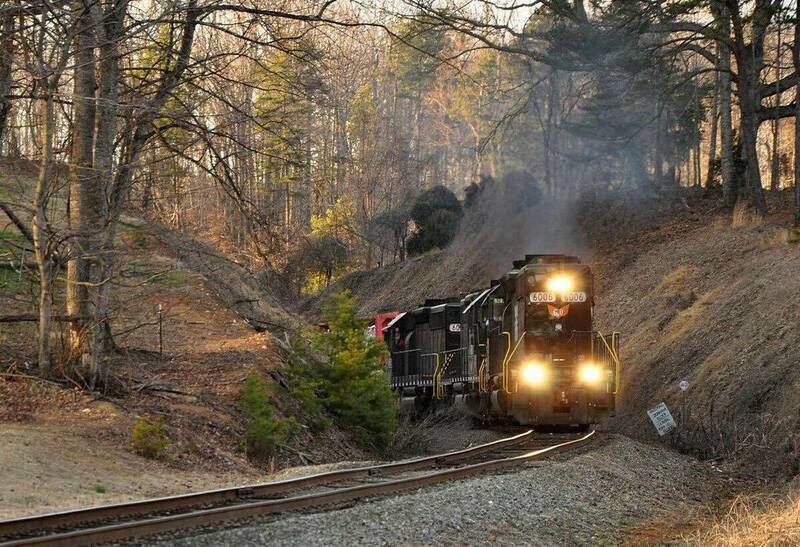 The Elkin Train does the same thing. It becomes ET2 and switching chores for the industries continue well into the late evening with the newly received tonnage YV1 brought westbound up the Yadkin River Valley that morning. Both crew swaps take place usually around lunch time. YV2 is usually headed back eastbound by around 12-1PM. Sometimes it will stop in Rural Hall and switch the transload or pick up any NCFI cars from the Mt Airy train. As an added note, the traffic volume on the Yadkin River line is heavier and the operating procedures consistent. Movements on the lighter density Mount Airy (A&Y) route are sporadic and operate as needed. 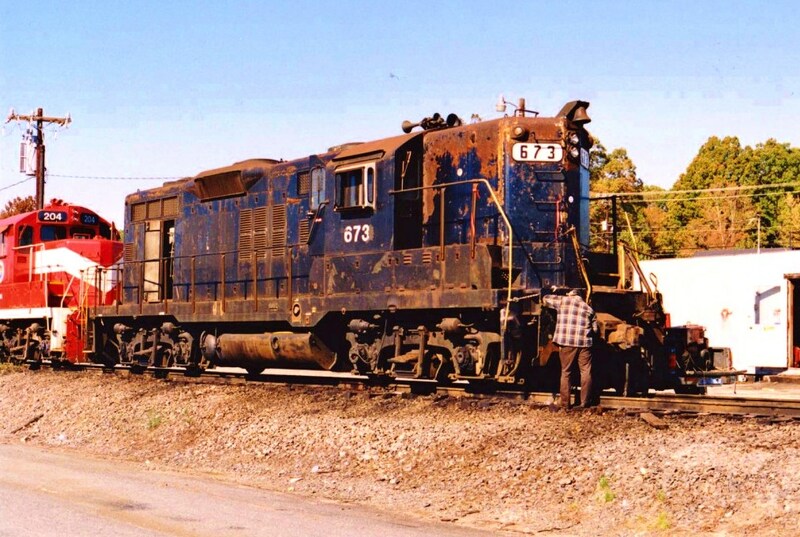 The early years of the Yadkin Valley Railroad were marked by a hodgepodge of models and paint schemes. 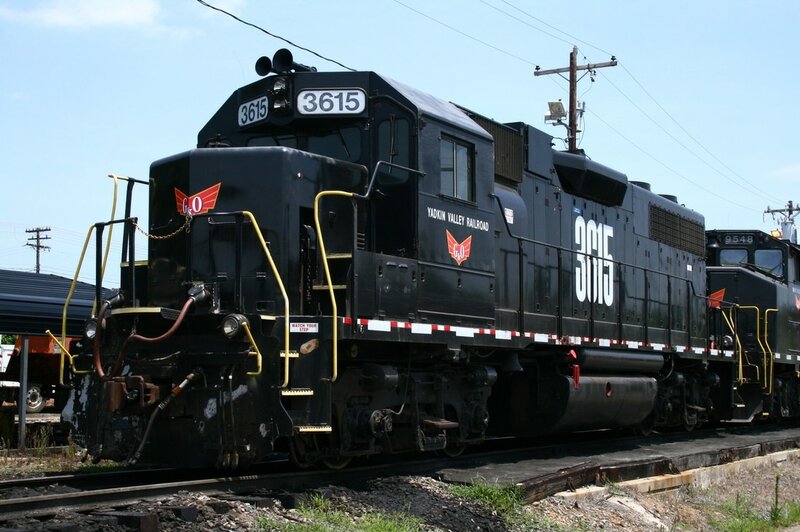 First generation four axle EMDs such as GP7, GP9, and GP10 models mostly comprised the roster. More than person familiar with the railroad has suggested the railroad should have retained the vivid red and white color combination. Below are examples of power that has dotted the roster during the time span of the YVRR existence. 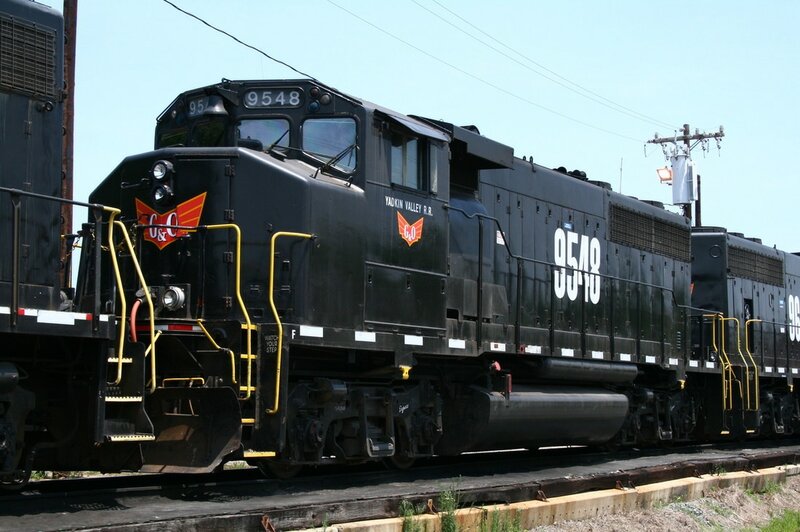 Once the Gulf and Ohio took over the railroad in 1994, it adopted the black scheme with red logos and large white numerals still in use today. Roster changes ensued with later models and wide cab variants as well as the addition of six axle power for a period of time. 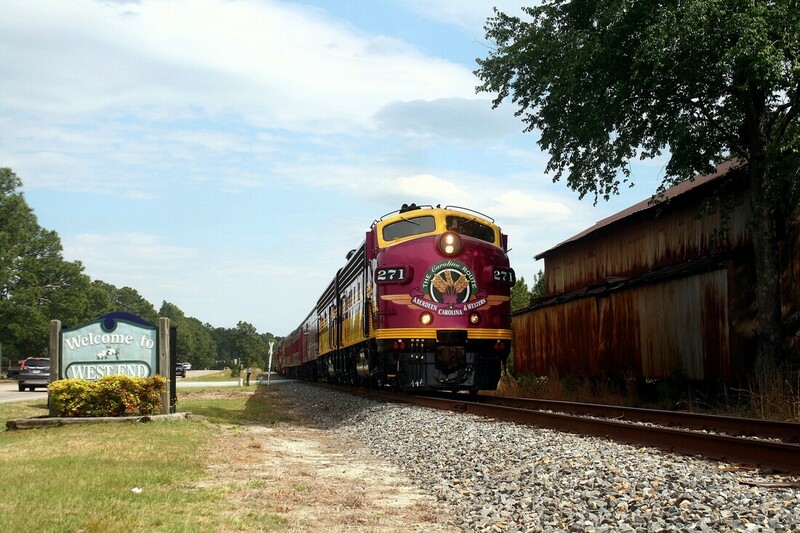 Winston Salem is, as it has been for more than two decades, the direct connection and lifeblood funnel for the Yadkin Valley Railroad. It is here that freight terminates from the Norfolk Southern for furtherance to the YVRR and vice versa for returning cars. This is in contrast to the Southern Railway era when the A&Y route from Greensboro was an alternative route that also served as a pipeline to the region when it was intact to Rural Hall. 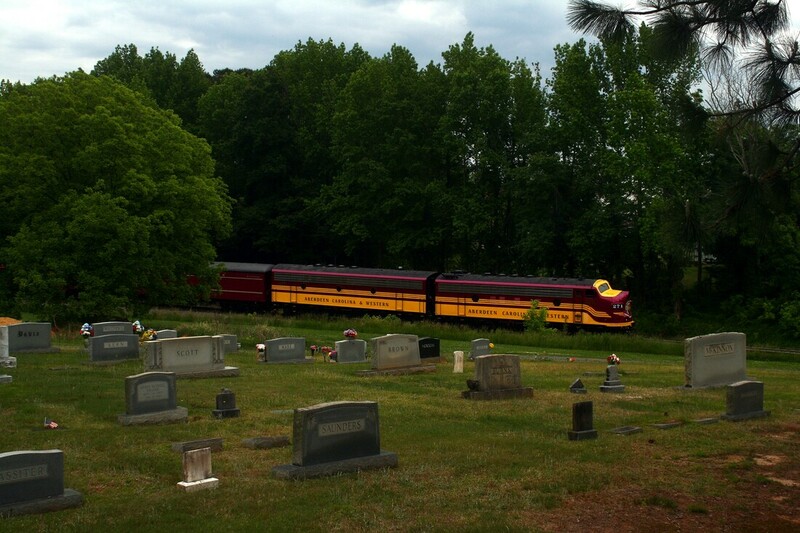 The YVRR in recent years obtained trackage rights on the NS owned line between Winston Salem and Rural Hall. 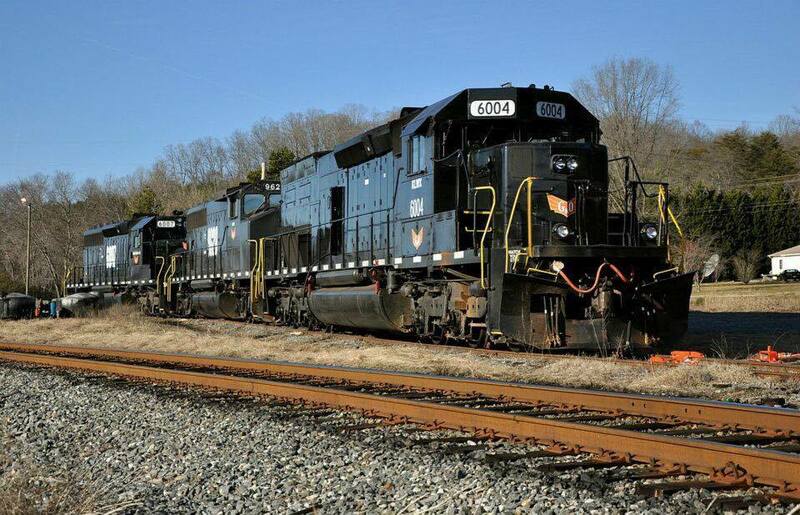 Its YV1 train originates at the NS Winston Salem Yard with freight for the YVRR. Conversely, YV2 will return cars to interchange the return to NS there. NS power will also run to Rural Hall on occasion on bulk grain trains bound for the feed mills. To visit the railroad environment at Rural Hall is to experience a throwback to an earlier time. Still possessing the atmosphere of railroading as it was decades ago, it is a time capsule of a small town railroad junction. The crown jewel here is the depot still resplendent in its unaltered state that exudes the spirit of a branch line Southern Railway. During the era of passenger travel, Rural Hall was a junction for diverging routes. The 1920s witnessed the arrival of the casual traveler destined for the resort hotels in the Saurertown Mountains. Vacationers disembarked from the trains here for these venues often spending a night at the Rural Hall Hotel which stood trackside. Patrons would also transfer from one line to another depending on the destination and the timetable schedules of a given era. 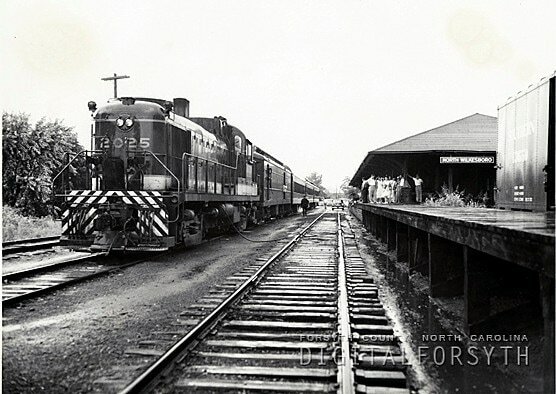 A&Y trains running between Mount Airy to Greensboro and Southern Railway scheduled trains operating between North Wilkesboro and Winston Salem to points south shared Rural Hall as a common denominator. 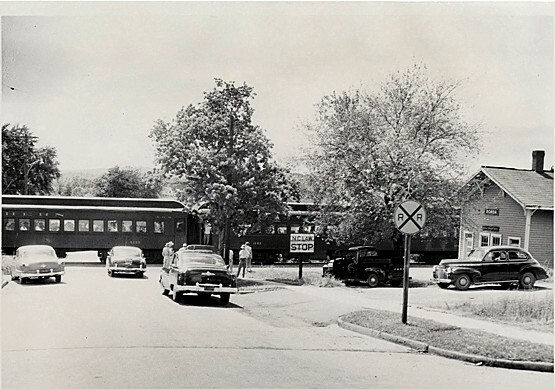 Rural Hall remained as a passenger stop on the A&Y until 1939 and the Southern route to North Wilkesboro until 1955 when the last train made its final run. A Google Earth view of the present layout at Rural Hall. As a junction for both the A&Y and Southern lines, tracks from four directions converged here. 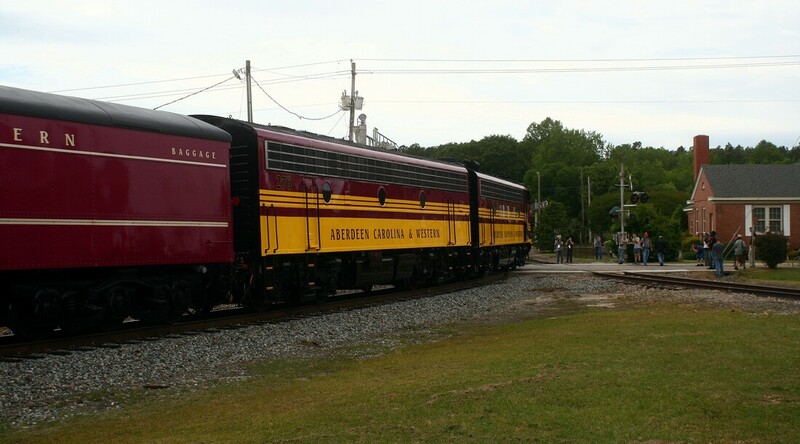 The Yadkin Valley Railroad utilizes three of these---the former Southern from Winston Salem to North Wilkesboro and the A&Y from Rural Hall to Mount Airy. Only a piece of the former A&Y to Greensboro exists with the remainder abandoned and track removed. Freight movements operated in a similar manner. 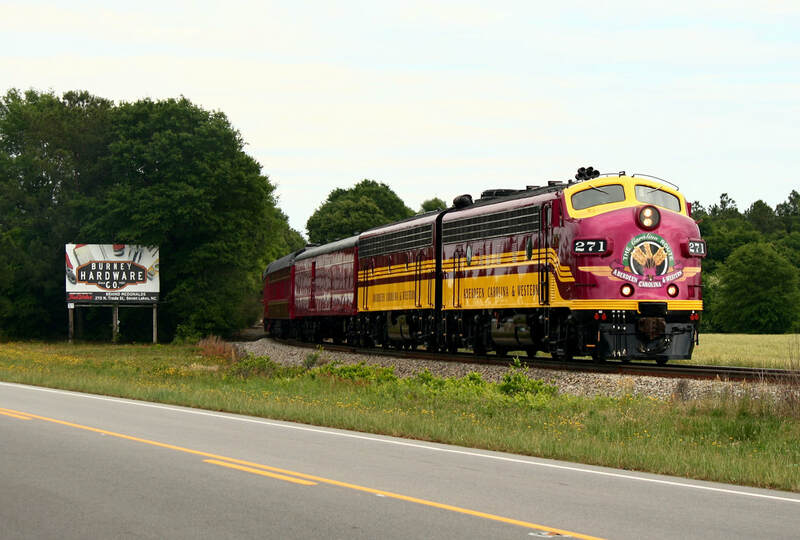 Dedicated timetable trains moved over the A&Y between Greensboro and Mount Airy and conversely on the Southern route from Winston Salem to North Wilkesboro. Technically, both railroads were Southern Railway but A&Y remained at least in name as a paper subsidiary of the Southern until 1950. The Mount Airy line, however, was referred as the A&Y route and continued as such--in certain circles, the application remains today. Both routes funneled traffic to and from Rural Hall and the freight sorted accordingly. 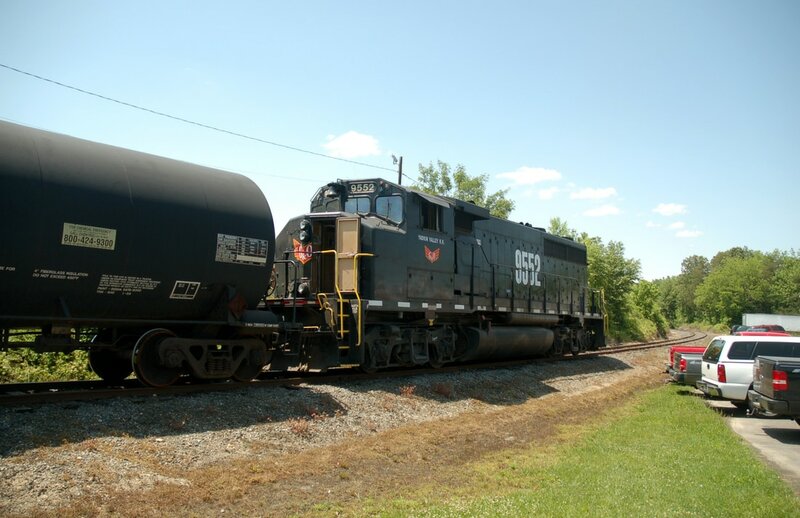 This was a practice that remained in effect until the A&Y route between Rural Hall and Greensboro, deemed redundant in modern operations, was cut during the early 1980s near the time of the merger that created Norfolk Southern. 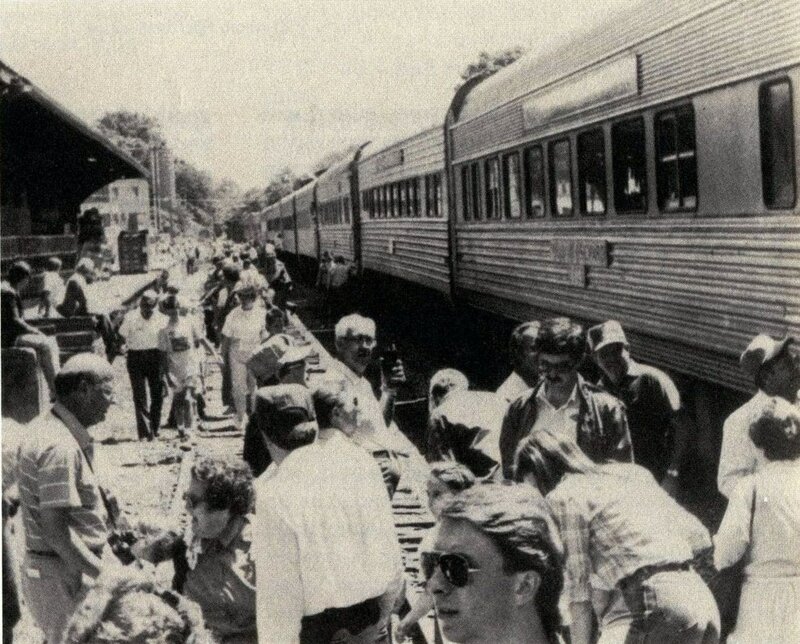 Although segments remained to serve remaining customers, the line was finished as a through route from Greensboro. A short remaining section of the former A&Y extends east from Rural Hall that is used for car storage. It is only through the perseverance of the Rural Hall citizenry that the depot remains today. Threatened with demolition by the end of the 1970s, preservation efforts were undertaken with funding raised to relocate the depot 200 feet onto the private property of D.J Redding, Jr. Not only did he provide safe haven for the depot but personally undertook responsibility for its restoration. 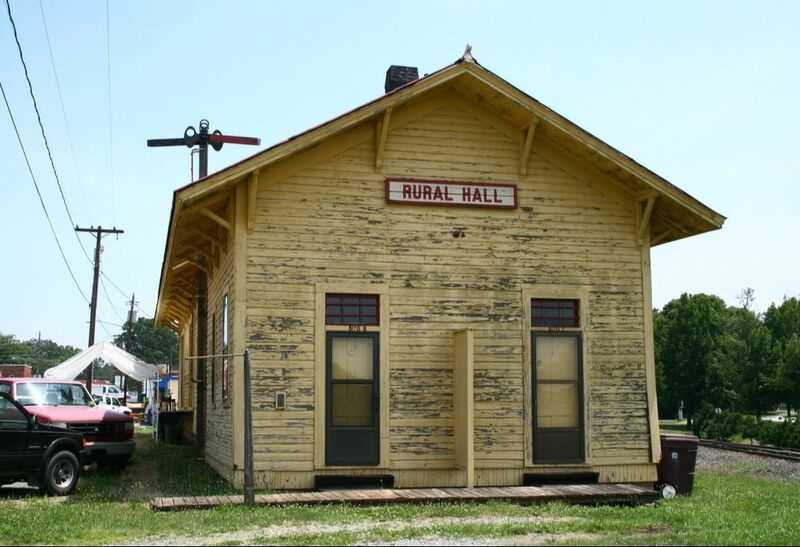 For nearly thirty years, Rural Hall has served as both administrative and operational hub of the Yadkin Valley Railroad. It is centrally located at the pivot point of its two diverging lines in addition to the funnel from the Norfolk Southern at Winston Salem. Inasmuch, all YVRR trains originate, terminate, or run through the location. On weekends, the majority of its road power is kept here and is visible on the tracks north of the depot. North of Rural Hall, the former Atlantic and Yadkin Railroad traverses a foothill region as it treks north towards Mount Airy and to the edge of the south slope of the Blue Ridge Mountain range. Along the route, it bisects the towns of King, Pinnacle, and Dalton before turning in a westerly direction to the Ararat River valley. Once it reaches the river, the railroad again turns north through Pilot Mountain and the community of Ararat following the river into Mount Airy. 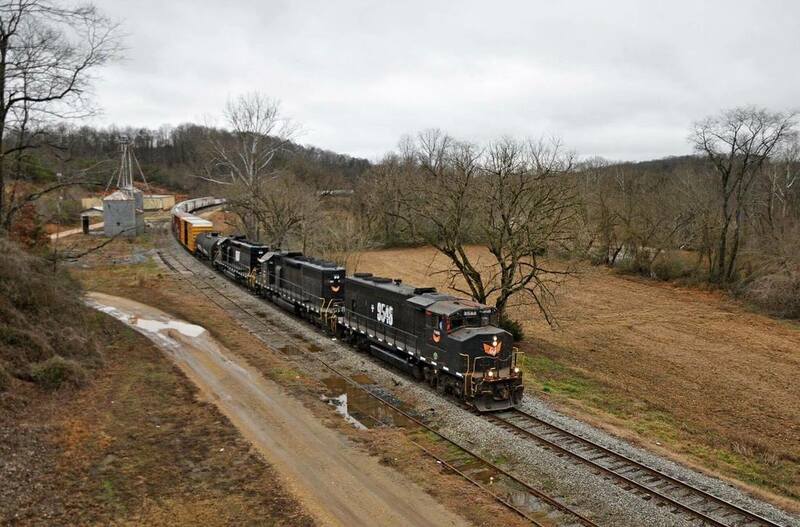 The A&Y line from Rural Hall traffic volume for the Yadkin Valley Railroad is considerably less than the former Southern route to North Wilkesboro. There are no remaining shippers on the route until reaching Mount Airy and only a couple remain. Hence, movements on this leg of the railroad are fewer and run as needed. 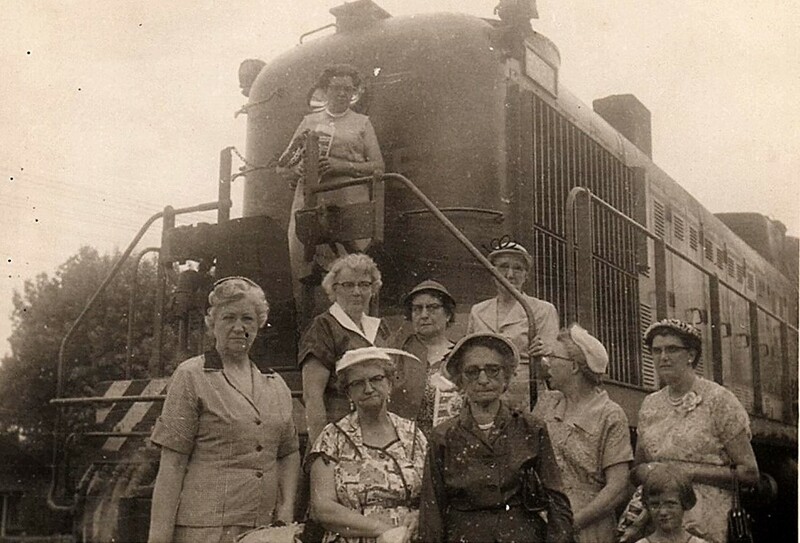 It is for this reason that photographs taken along this region of the railroad are less in number. The first stop north of Rural Hall on the A&Y route is the city of King. Compared to neighboring communities, King is a relative newcomer. It was not until the early 1800s that the area was settled in earnest and at this time, comprised of four small villages. Business was first established circa 1880 and by the end of the decade, the township name was Kings Cabin. Of note was a store and large manufacturing plant by Lewis Grabs and Sons. 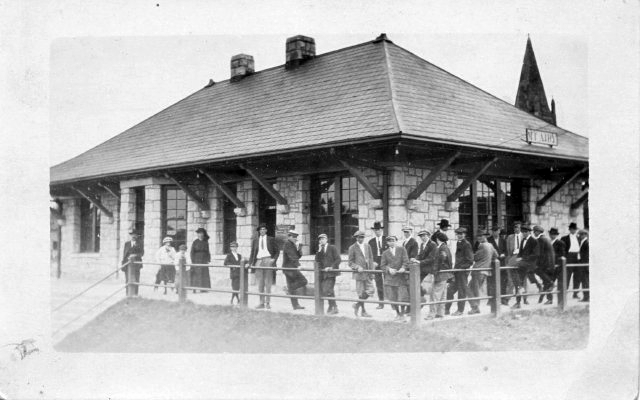 When the railroad arrived in 1888, a depot was not initially constructed. The townspeople built a depot and sold it to the railroad for $1.00 thereby insuring a prominent location along the route. Throughout the years, King continued to grow by means of the railroad and its proximity to Winston Salem. 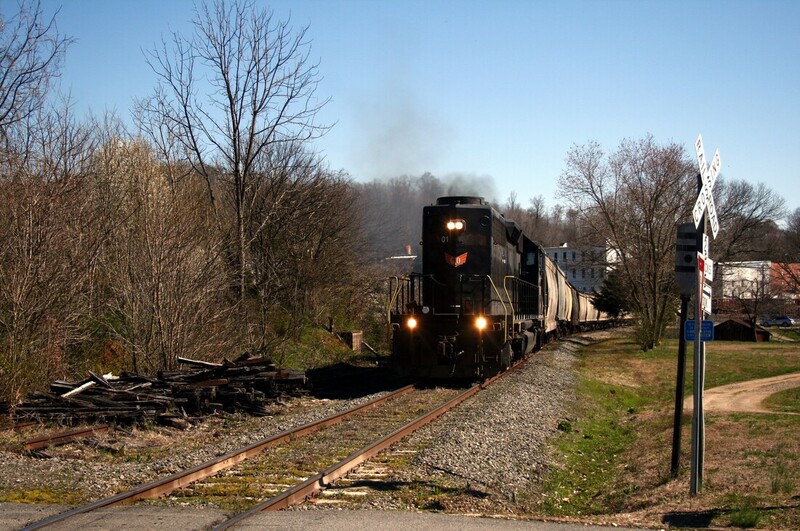 The Yadkin Valley Railroad passes through the heart of the city with rail traffic moving to and from Mount Airy. Although there are no active shippers on the route in King today, a siding remains intact to the King Sand and Supply business. Two towns on the former A&Y between King and Pilot Mountain are Dalton and Pinnacle, respectively. Both were listed timetable stops during the passenger train era and small industries were also served by the railroad. There are no active shippers on the Yadkin Valley Railroad in these communities at present. The region of the railroad flanked by the communities of Dalton and Pinnacle. Largely rural, the area is marked by the small towns, small businesses, and increasing elevation moving north. 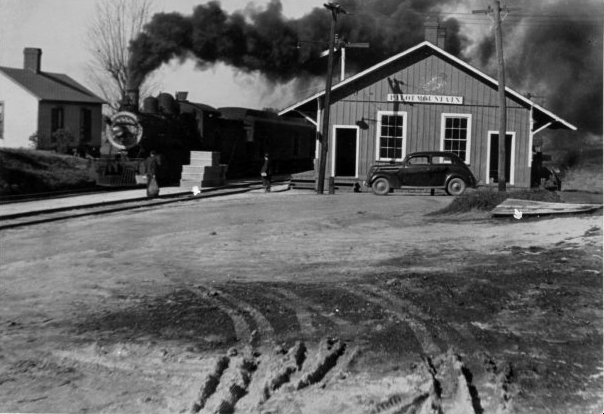 Two views of the Pilot Mountain depot area taken during the late 1930s. Both images capture a southbound train at the depot from obviously different vantage points with the one at right including the track layout as it was. The automobile must belong to the station agent as it appears in both scenes parked in the same spot. Images Surry County Historical Society. 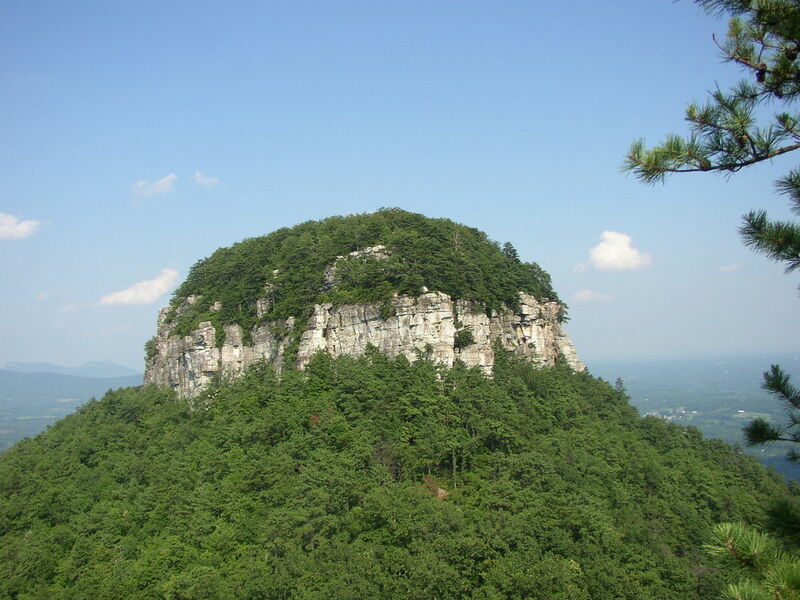 Named for a distinctive metamorphic quartzite monadnock (isolated rock hill), Pilot Mountain owes its beginnings to the Saura people that inhabited the area in the late 1600s. Later, colonists migrated to the region in the 1700s and a settlement was gradually established. The land first lent itself to agriculture as small farms were established for growing crops and especially tobacco. 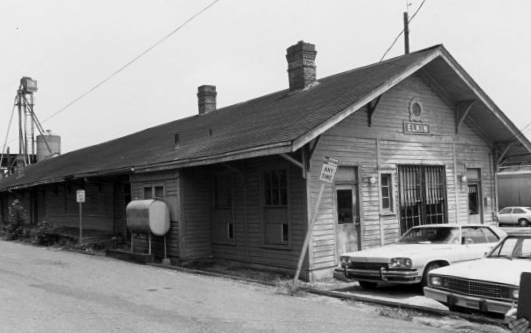 When the track of the Cape Fear and Yadkin Valley Railroad was constructed through the area towards Mount Airy in 1888, the depot became the town center of Pilot Mountain and the center of commercial growth. In fact, it was the coming of the railroad that led to the incorporation of the town. 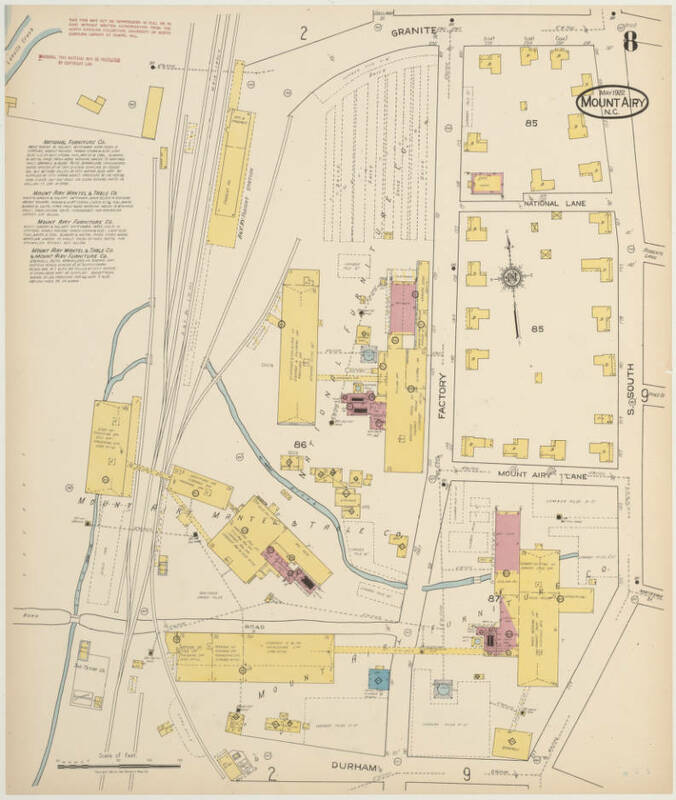 Industry did not necessarily develop along the railroad but rather utilized it by means of its depot. 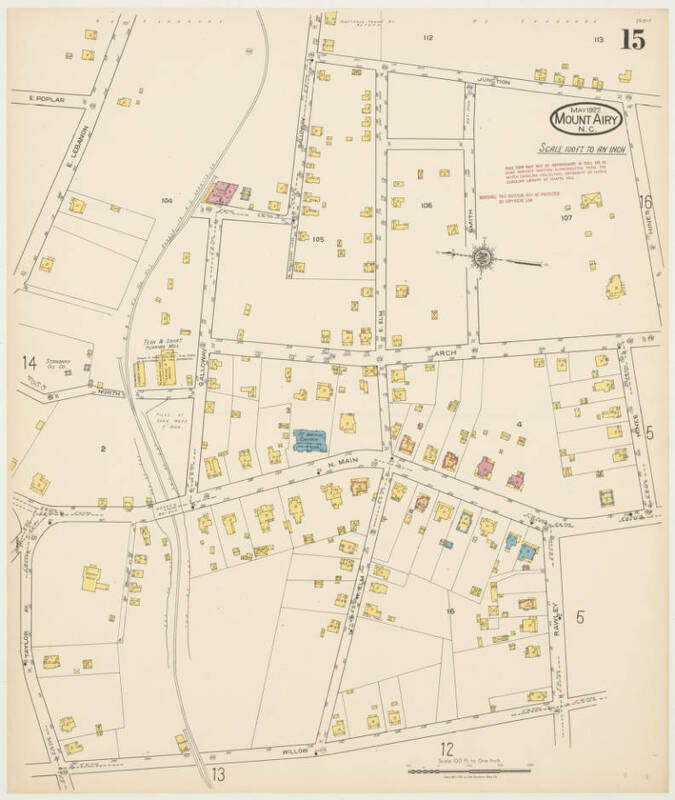 A listing of the businesses located in Pilot Mountain during 1910 would include Pilot Mountain Cotton Mills, K. Nicholson Furniture Company Factory, Redman Brothers Fertilizer Warehouse, and various tobacco firms. Once the railroad was completed to Mount Airy, a significant impact on Pilot Mountain was the construction of hotels and boarding houses for business travelers and those seeking respite at area mineral springs resorts. Late to the region was the arrival of textile manufacturers during the 1940s that remained a cog in the local economy for fifty years. 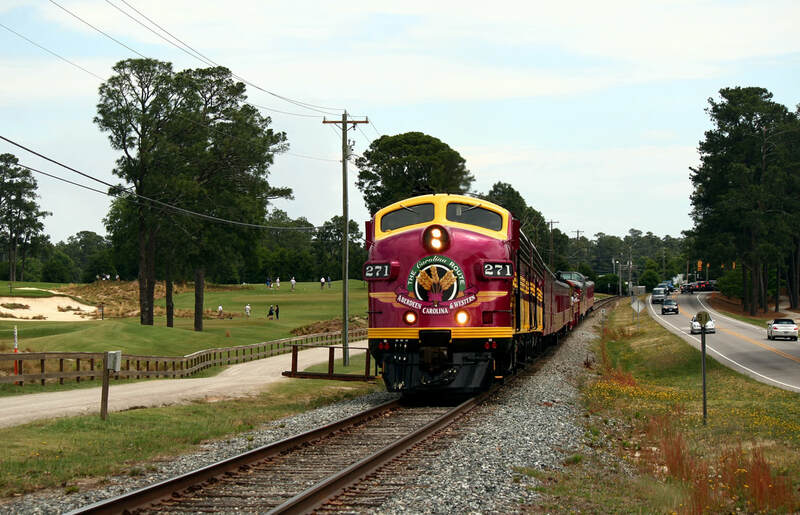 The Atlantic and Yadkin Railroad/ Southern Railway continued to serve the area and passenger service until the latter was discontinued in 1939. 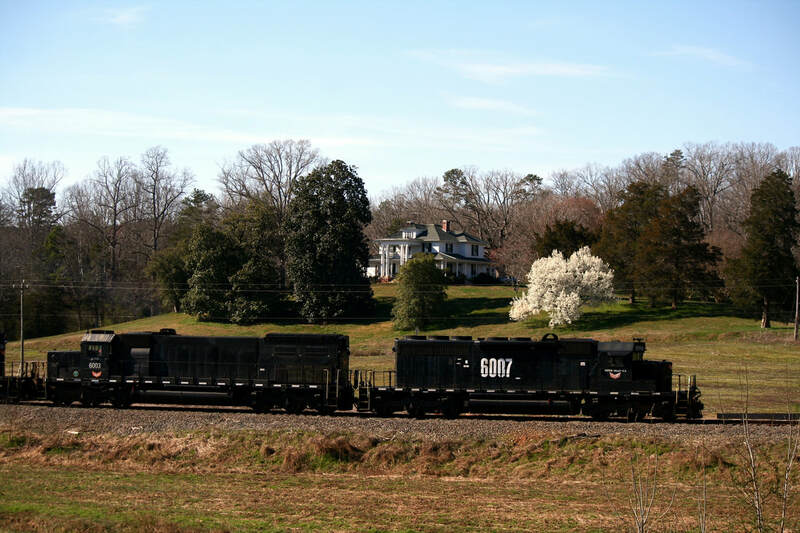 Today, the Yadkin River Railroad remains and although no online shippers currently exist, its trains pass through to and from Mount Airy. A 1910 Sanborn map of Pilot Mountain. Curiously, the railroad is not included on this sheet to depict the trackside shippers that existed at that date. There is no doubt that shippers included on this map utilized the A&Y depot in some capacity. Between Pilot Mountain and Mount Airy, the railroad passes through a rural region paralleling the Ararat River. Bucolic with sparse population, it nevertheless was a scheduled passenger timetable stop during the A&Y era at the tiny hamlet of Ararat. 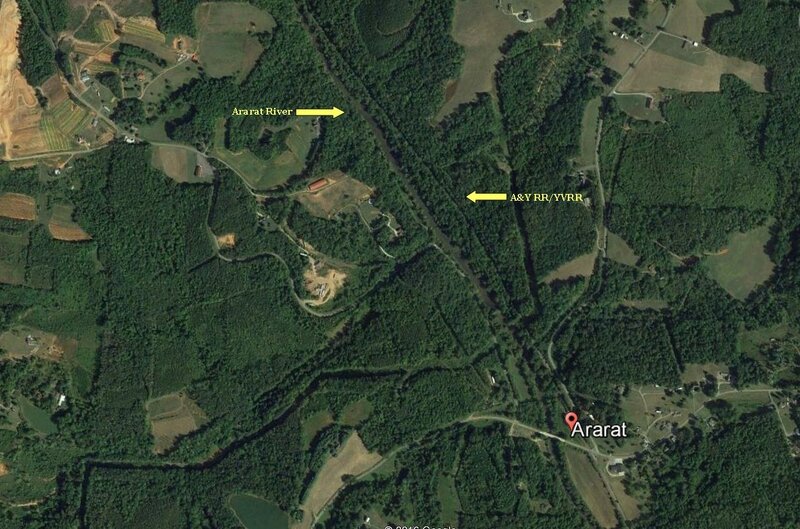 Google Earth view of the region of the Ararat River between Pilot Mountain and Mount Airy. The small hamlet of Ararat is situated along its namesake river in a rural and sparsely populated area. Nearly a century before native son Andy Griffith achieved stardom and the fictional counterpart of "Mayberry" was ingrained in culture as the town signature, Mount Airy was developing town within a stone throw of the Virginia border. The region was settled during the 1750s as a stagecoach stop but it was only after the Civil War that the community began to develop. After incorporation in 1885, industry such as tobacco, textiles, and furniture making emerged but it was the development of granite excavation from quarries that distinguished it. 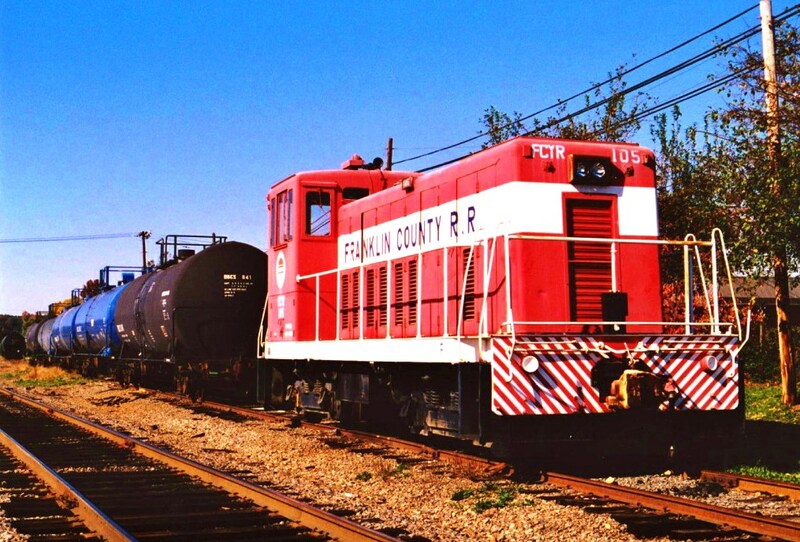 Once the Cape Fear and Yadkin Valley Railroad reached Mount Airy in 1888, the town began to prosper with the development of these industries alongside its rails. 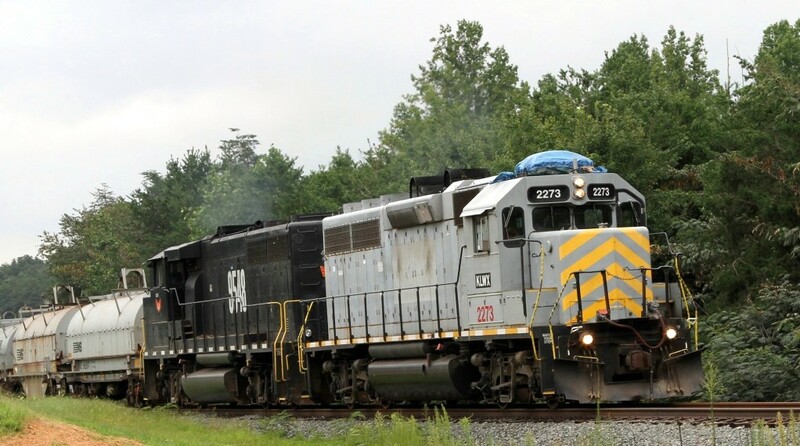 Within a few years, a freight route was intact to Wilmington on the Atlantic Coast continuing with the successor Atlantic and Yadkin Railroad. 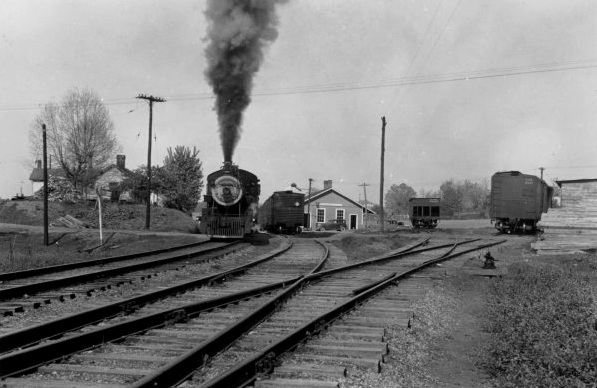 With the presence of both the Southern Railway and Norfolk and Western Railway at Rural Hall and Winston Salem respectively, Mount Airy was connected to a larger rail network that further spurred prosperity and a means for expanded passenger rail travel. 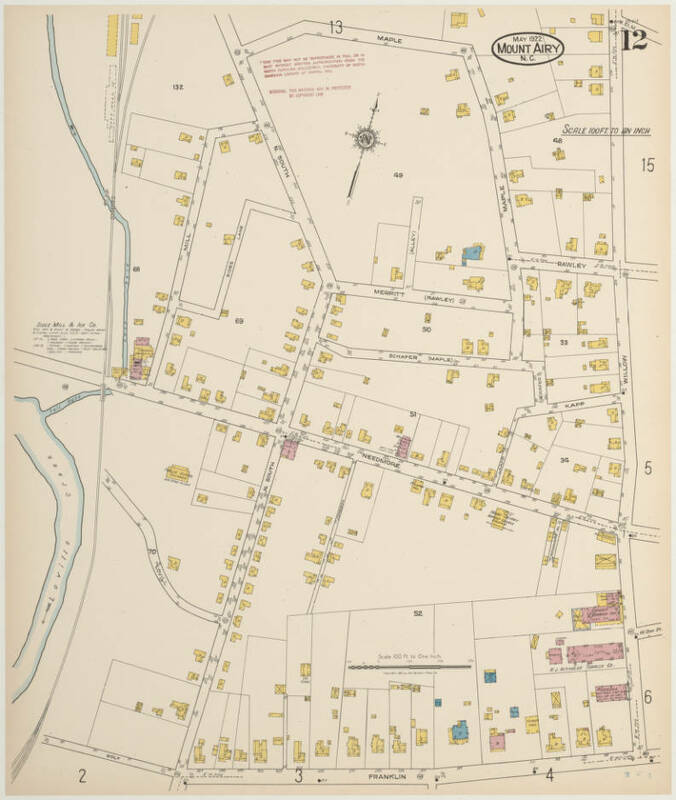 In 1922, the heart of Mount Airy was dominated by furniture factories. Three large companies at this time included National Furniture Company, Mount Airy Mantel and Table, and the Mount Airy Furniture Company. The A&Y/ Southern Railway freight station was also located here. The first commercial businesses to establish in Mount Airy were the tobacco warehouses predating the arrival of the railroad. Businesses such as the Sparger Brothers Plug Tobacco, Fulton Tobacco, and the Globe Tobacco Warehouse occupied the business district but none were directly served by rail. If any of these firms utilized the railroad, it was by use of the freight house. 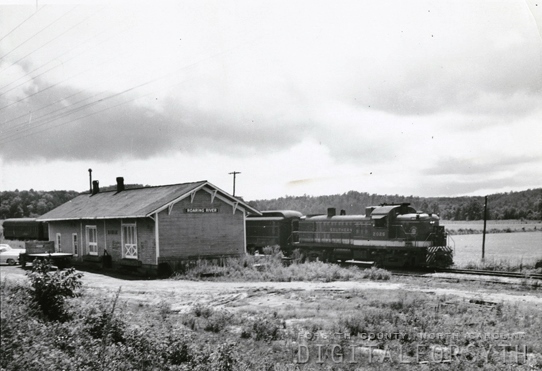 Located along the relatively level plain of Lovills Creek, three large furniture factories were constructed along the railroad creating carloads of lumber received and the finished product shipped out. By the 1920s, these firms were the National Furniture Company, Mount Airy Furniture Company, and the Mount Airy Mantel and Table. 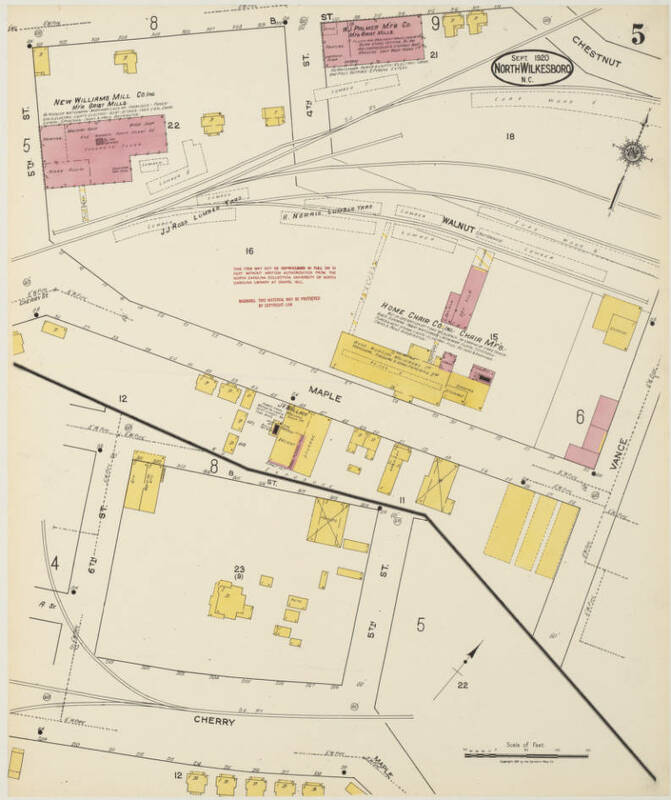 The A&Y freight depot was located nearby as was a small yard in which to classify the cars at Mount Airy. Beyond the freight station on the east side of the railroad was located the A&Y passenger station. This unique structure constructed of granite blocks would serve Mount Airy until the discontinuance of trains in 1939. Smaller warehouses also populated this district for the storage of such commodities as grocer goods and lumber. The heart of the business district as it was in 1922. 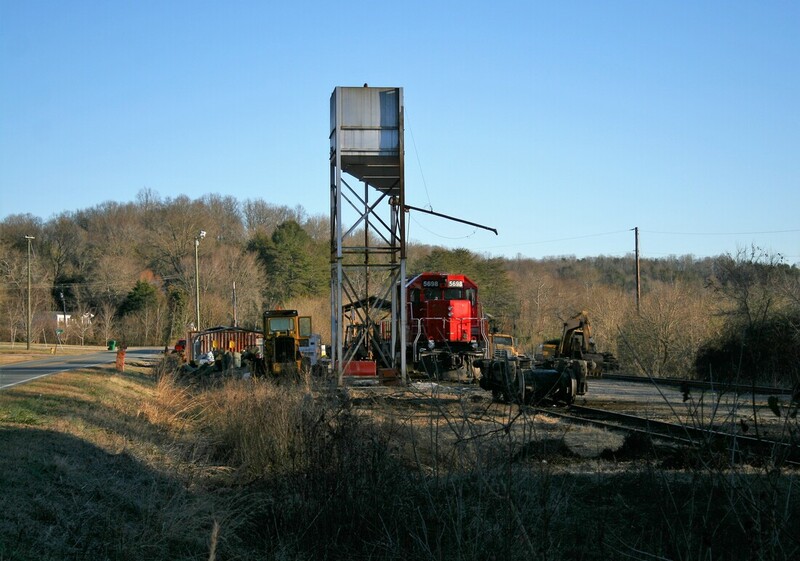 The long established Sides Mill is located at the Needmore Street grade crossing. A Southern Railway 2-8-0 passes by the location of Sides Mill in this photo from 1939. Image Surry County Historical Society. The North Carolina Granite Corporation, in existence since 1889, was instrumental in the development of the railroad stations on the route. Thomas Woodroffe was the individual chosen to embark on this undertaking using granite from the quarries for construction. He was also responsible for organizing the NCGC as a corporate entity. Moving eastward from town, the railroad served the Mount Airy Granite Cutting Company and a junction with the Mount Airy and Eastern narrow gauge railroad. At the terminus of the A&Y was the North Carolina Granite Corporation with multiple facilities. 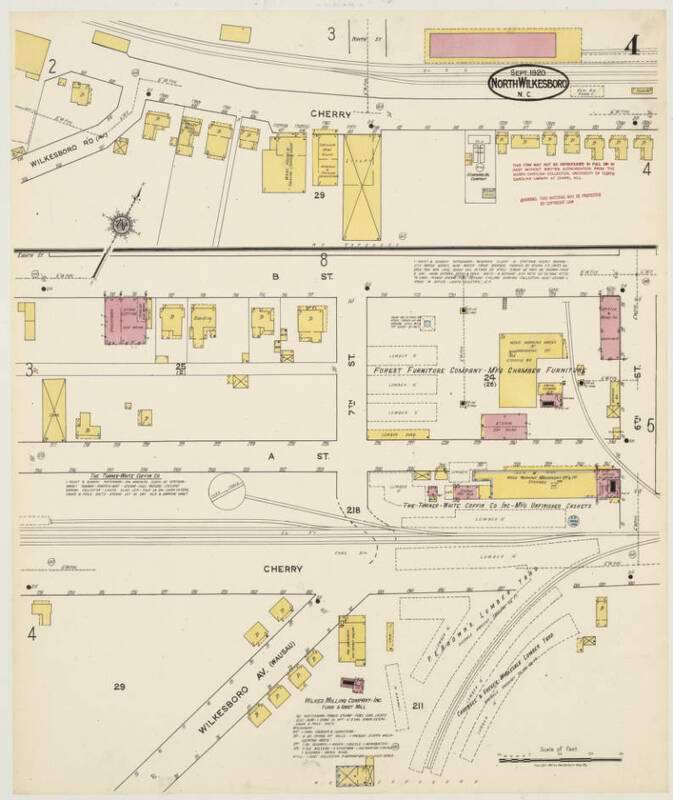 This area encompassing Granite and West Pine Streets included the A&Y passenger depot and the Foy Lumber and Manufacturing Company. 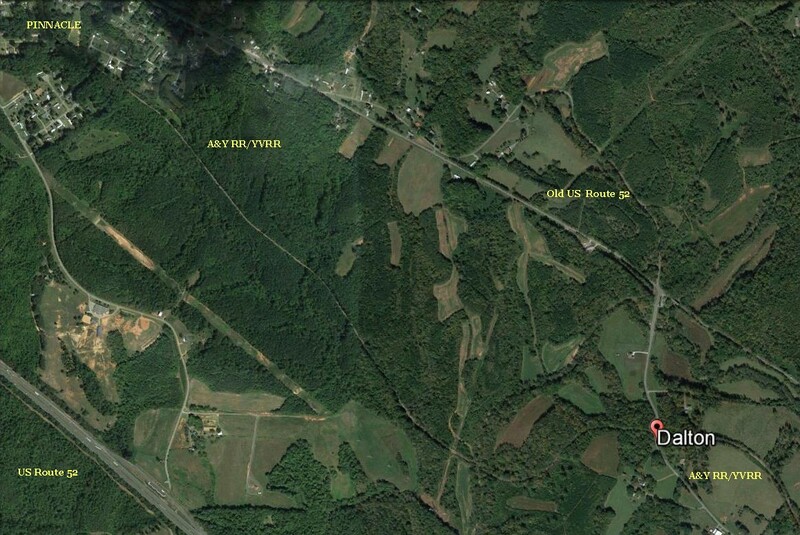 At the northern reaches of Mount Airy the railroad constructed a wye with extensions from either side. Flanking the line here was C.C Smoot and Sons Tan Bark Sheds and one leg extended to the Virginia-Carolina Fairgrounds and the other to the North Carolina Granite Corporation. As the railroad moved north through the heart of town, industry was less compressed---rather, it was scattered at various points on the route. These shippers were varied such as the Sides Mill at Needmore Street and farther north, the large C.C. Smoot and Sons Tan Bark Sheds. The latter was situated on the railroad at a wye where steam locomotives were turned on both freight and passenger trains for their southbound trips. 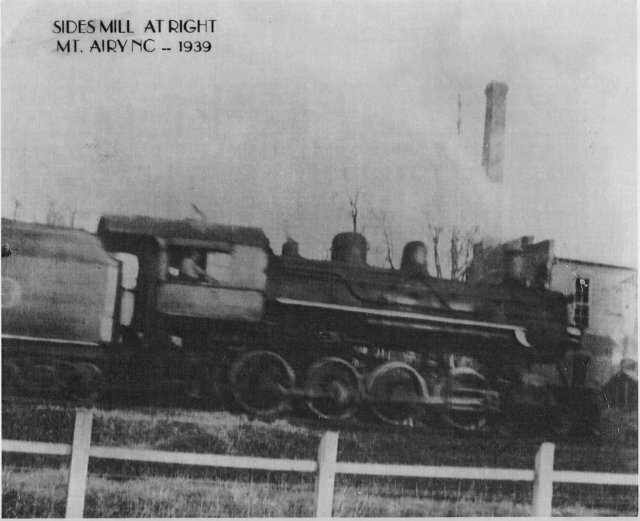 At the wye, the northern stem of the A&Y continued for only a short distance before terminating at the Virginia-North Carolina Fairgrounds. This area was also adjacent to the City Water and Light Pumping Station. ​The primary track from the wye connection diverged eastward through Mount Airy as it headed towards the North Carolina Granite Corporation and its quarries. As it passed through town, other shippers extant in 1922 included Standard Oil, Tesh Planing Mill, and the Flour and Feed Warehouse. Although an economy dominated by furniture and granite excavation comprised the bulk of the carloads, independent smaller companies added diversity of product and shipments along the line. From the wye, the main stem of the railroad continued east crossing over Main Street. Spurs along the way served the Standard Oil Company, Tesh Planing Mill, and Flour and Feed Warehouse. Faded with the passage of time, Mount Airy was once home to a second railroad. 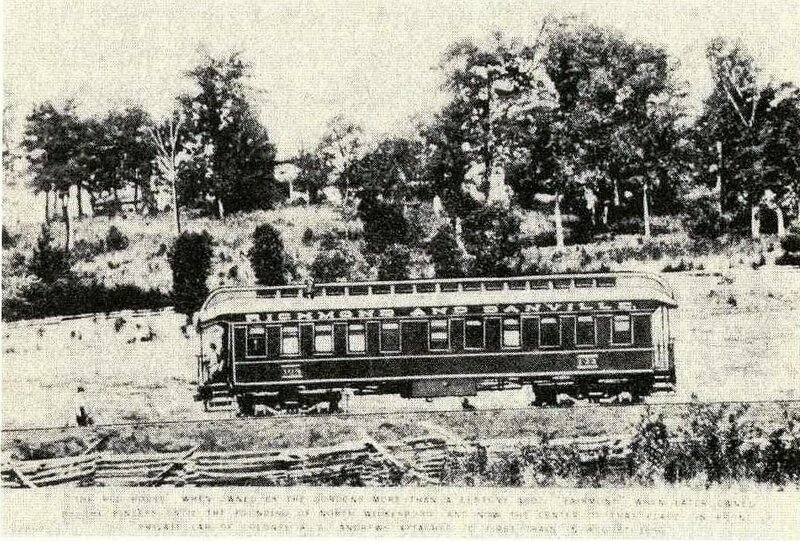 The narrow gauge Mount Airy and Eastern Railroad, affectionately nicknamed "The Dinky",this three foot gauge line was nineteen miles in length connecting Mount Airy with the Kibler Valley across the border in Virginia. Constructed in 1899, it remained in operation until 1918 when it was charted under the new name of Virginia and Mount Airy Railroad. By this date, it had become a paper railroad only as it never operated again. 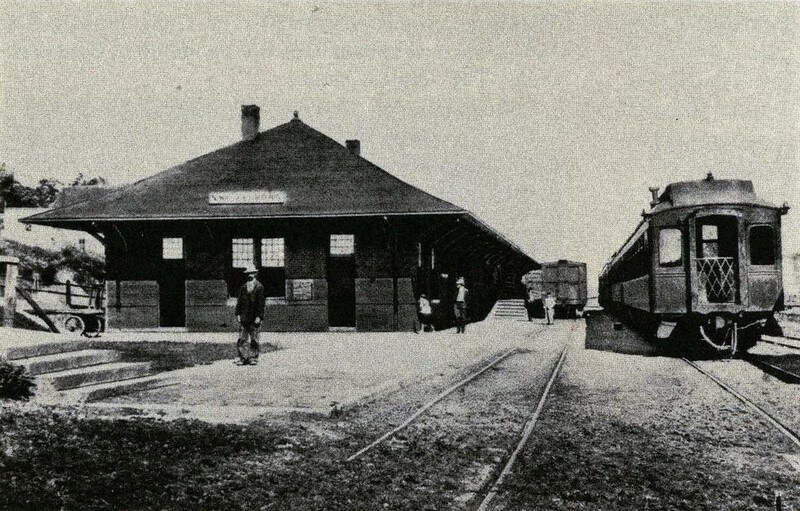 The MA&ER housed a passenger and freight station at Mount Airy and interchanged with the A&Y. Since the two railroads were of different gauges, freight would be transloaded from one railcar to another on adjacent tracks. 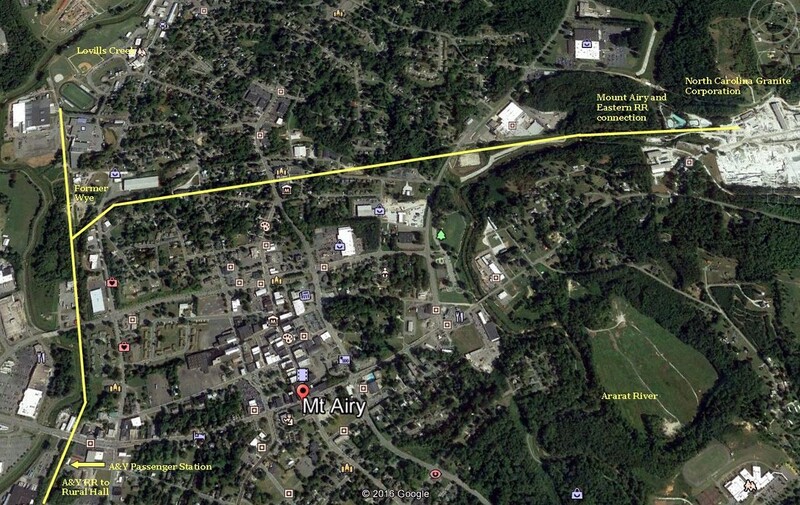 Google Earth view of the heart of Mount Airy. The out of service railroad is indicated by yellow lines also indicating the former wye and former MA&ERR connection. The A&Y passenger depot and North Carolina Granite Corporation locations are also marked. Traffic volume at Mount Airy is substantially less than in years past. The founding industries of the town such as tobacco, furniture, and textiles have long since vanished from the scene or no longer rely upon the railroad. Within its boundaries the railroad is extant but not in use but for a few remaining online shippers that emerged in contemporary times. Rail remains intact to the North Carolina Granite Corporation but has been dormant for years. 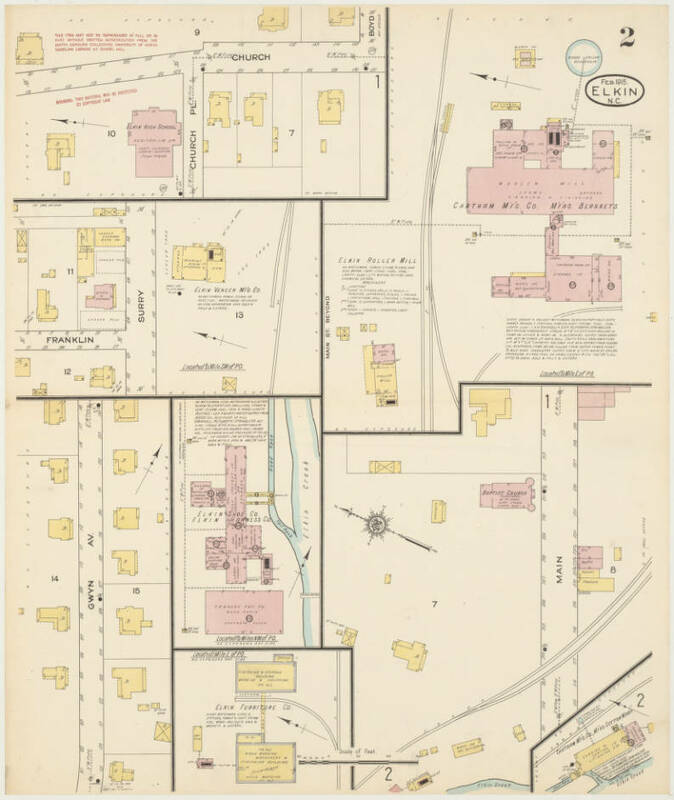 This 1891 topographic map includes a new addition---the Greensboro and Wilkesboro Railroad (North Western North Carolina Railroad) that was constructed the previous year. 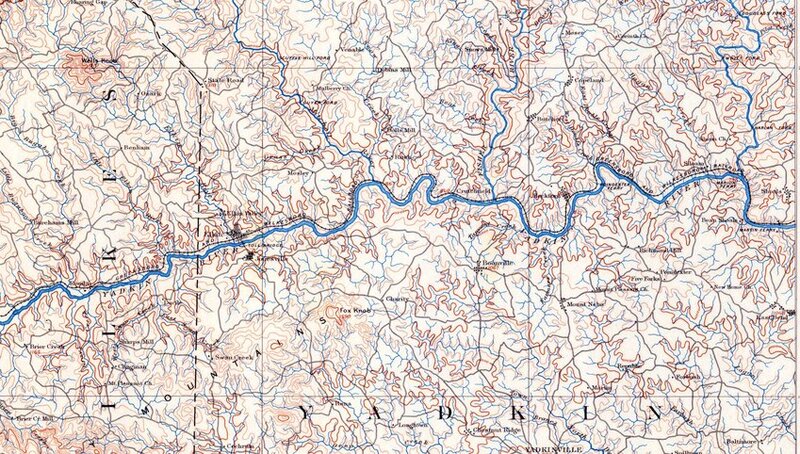 Capturing the heart of the railroad in the Yadkin River valley, this map covers the territory east of North Wilkesboro and the region west of Tobaccoville. Moving west on the former Southern Railway from Rural Hall, the railroad cut across rolling hills and farmland as it approached the next community of Tobaccoville. As one might suspect, the town received its name by virtue of this industry as there was a plug tobacco factory located here during the 1870s. The post office adopted the name in 1887 and it was retained even into incorporation in 1991. 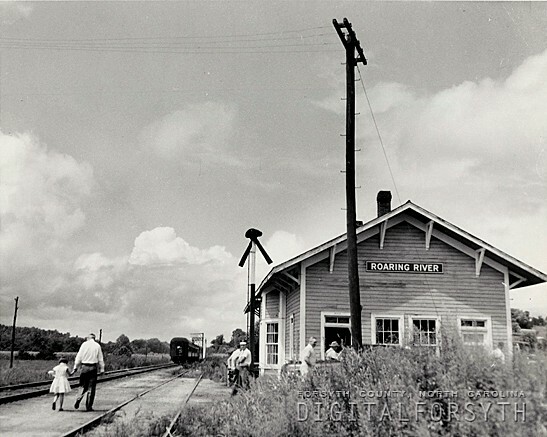 In addition to the early tobacco rooted heritage, the community was a crossroads for mail and travelers to and from the Yadkin River valley.The arrival of the railroad in 1890 facilitated the move of the post office to its proximity and it was a active passenger stop on the route. 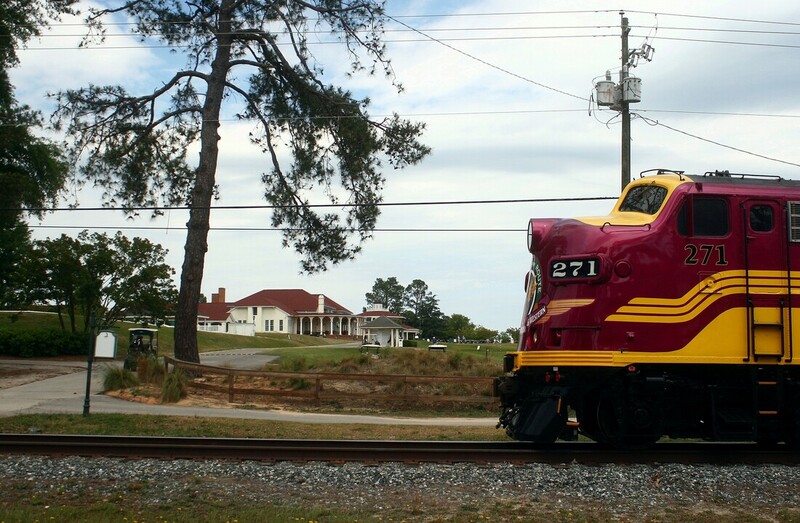 In tune with the Tobaccoville heritage, RJ Reynolds constructed a plant and retains a siding from the present day Yadkin Valley Railroad although it has not shipped by rail in more than a decade. The cacophony of steel picks driving steel spikes echoed along the Yadkin River in 1890 as railroad construction moved west. Building in the spirit of the future, perhaps unbeknownst to many a worker was the laying of track on ground once marked by the footprints of the legendary Daniel Boone more than a century earlier. A wide river valley lay before them already broken by the farmer's plow reaping the rewards of a fertile soil that these steel rails would further develop. It would be the first step of progress soon to be followed by the aspiring entrepreneur. 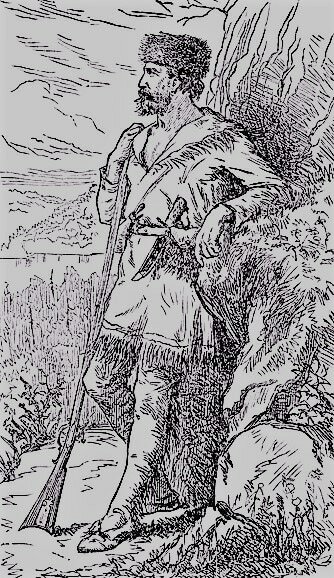 The fabled frontiersman of early America, the heroic Daniel Boone. He spent the early years of his life in the valley where YVRR trains run today. 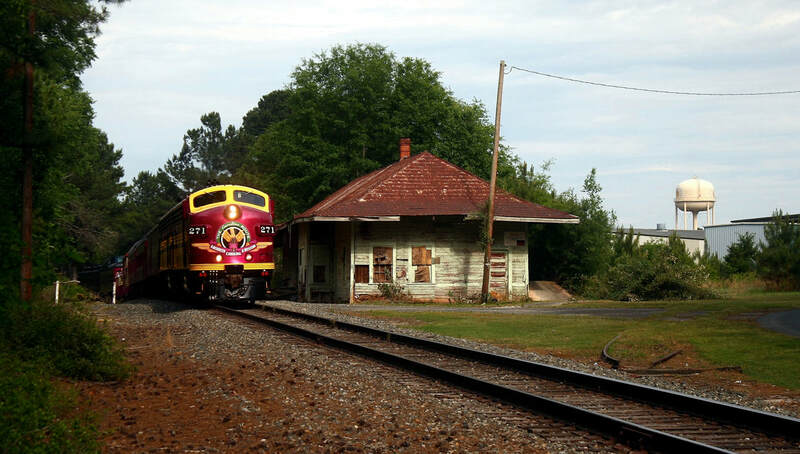 ​When the railroad reached the area, a depot was constructed and remained in use until the end of the passenger train service during the mid-1950s. 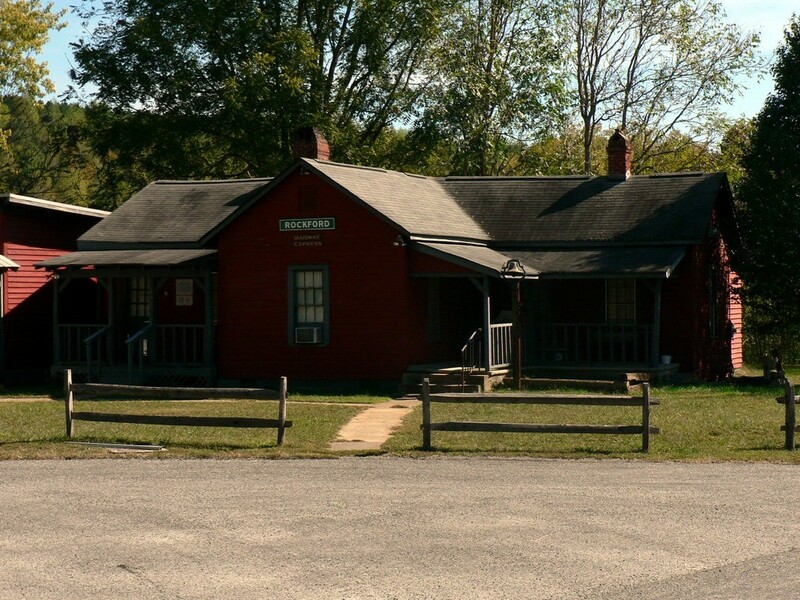 Although small in size, Donnaha remains an important location for the Yadkin Valley Railroad as a locomotive service station. The facilities are located on a siding from the main line on the western end of the community. ​Siloam was first established in 1818 with a post office constructed by 1830. During the Civil War, the Union Army presence is documented with the Stoneman’s Raid that moved through the Yadkin River valley. A century later, this small community suffered tragedy when the bridge spanning the river here collapsed in 1975 taking four lives and injuring sixteen others. With the coming of the railroad in 1890, the region developed and primarily from an agricultural perspective. The Yadkin River valley broadens in width here where prime bottom land exists for farming. Cutting through the heart of this plain is the railroad as it temporarily moves from directly paralleling the riverbank. An important shipper for the YVRR exists here, the Detroit Salt Company. Salt is mined from beneath the Motor City and transported by rail to this facility at Siloam from where it is distributed as street and sidewalk ice melt during the winter seasons. 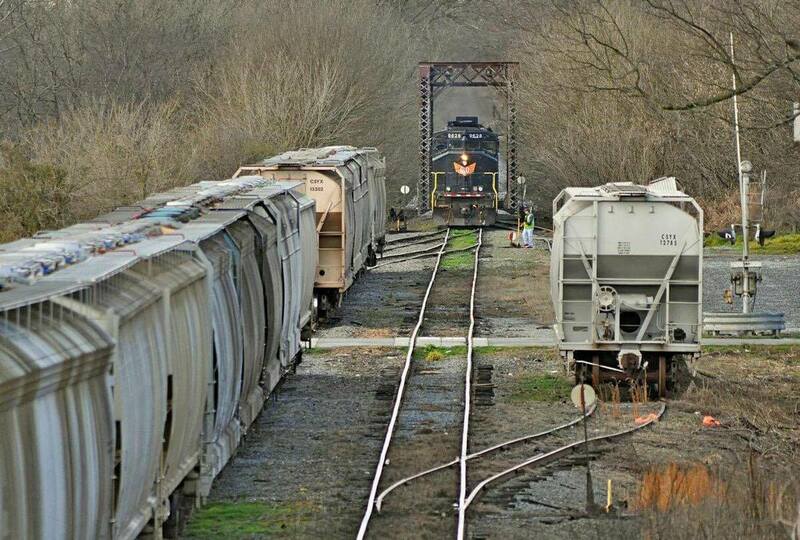 The trains of the Yadkin River Railroad today pass by what is now the sleepy village of Rockford. This small hamlet was not always this tranquil for its distant past includes political prominence for the area and commercial activity. During the post-Revolutionary War era, Surry County was formed and by 1790, Rockford was established as the courthouse. For the next half century, the community remained as a political center –meanwhile, local trade flourished and the establishment of taverns, grist mills, ferries, and various town businesses. By 1850, the political standing of Rockford shifted when Surry County was divided and the county seat henceforth moved to Dobson. Thus the shift from political to a namely commercial township commenced and the region settled into a constant state. When the railroad arrived in 1890, the town received a literal and figurative head of steam as new found growth evolved around it. Work and maintenance crews were hired locally and the depot became the center of activity handling mail, express, general freight and maintaining a telegraph office. 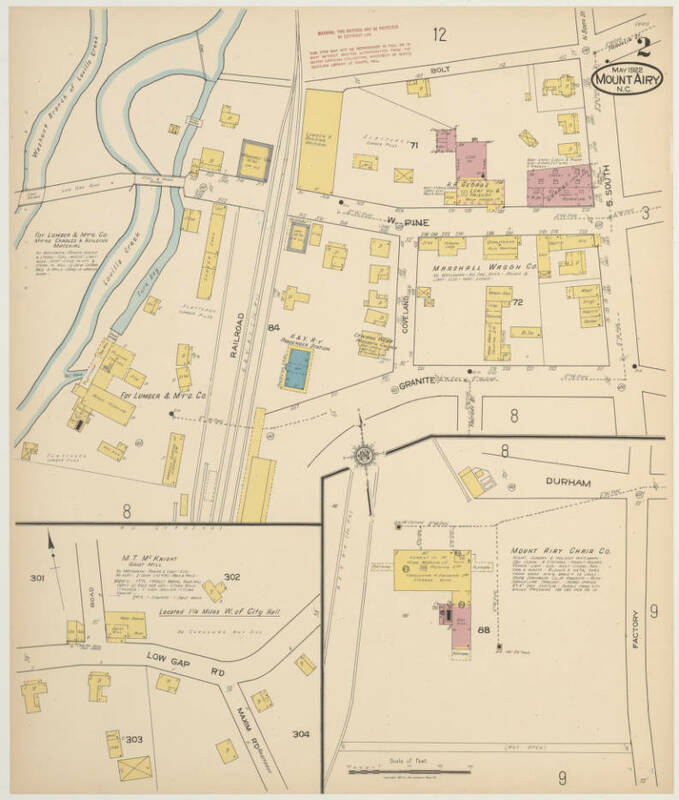 A thriving lumber business was established with the construction of saw mills and the railroad constructed a small yard at Rockford to handle the business. 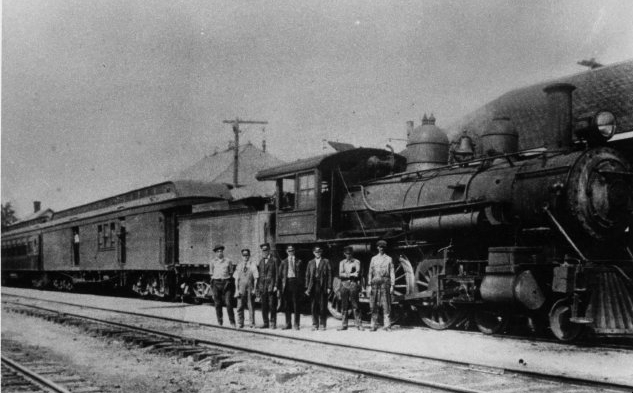 Rockford attained its economic peak during the early 1900s as tobacco became a thriving cash crop keeping the depot busy with shipments east to Winston-Salem. 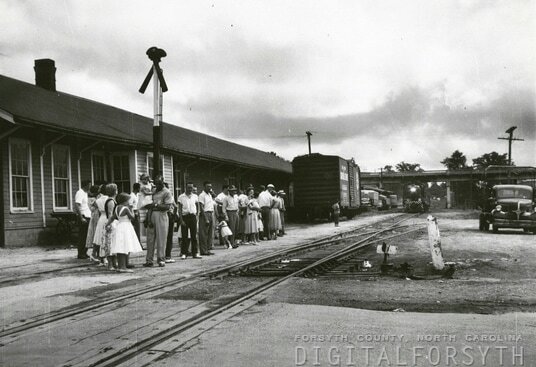 During this era, two regularly scheduled passenger trains also stopped at Rockford as with other towns along the line. Eventual decline set in and part by two elements of nature. First, the very nature of the topography at Rockford was a hindrance to continued expansion due to the rocky hills it was situated at. Later, the devastating flood of 1916 caused severe damage and within a few years, automobiles began bypassing Rockford on improved roads. As a result, a commercial shift transpired through the years creating the town as it exists now. Near the mid-point of the line extending to North Wilkesboro is the timetable location of Crutchfield. This community was born with the coming of the railroad and was so named in honor of Charlie Crutchfield, a railroad worker that died during construction of a nearby bridge. 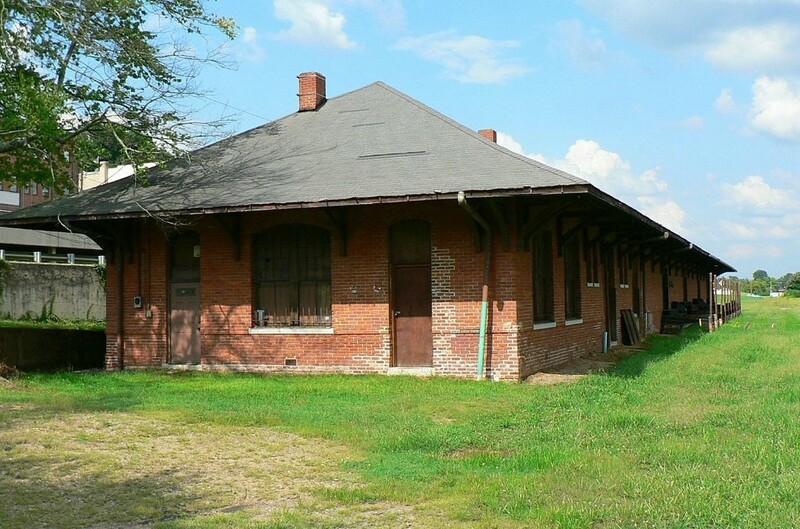 A depot was located here serving both passenger and freight needs and remained in use through the Southern Railway era. The siding here remains and in recent years coil cars were spotted here for the trans-loading of steel. 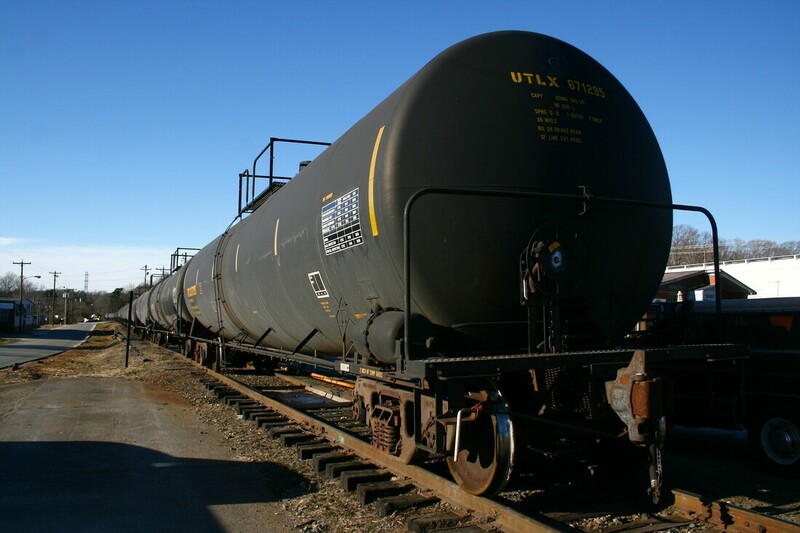 When not in use for this purpose, it has also been utilized for maintenance of way equipment and car storage. 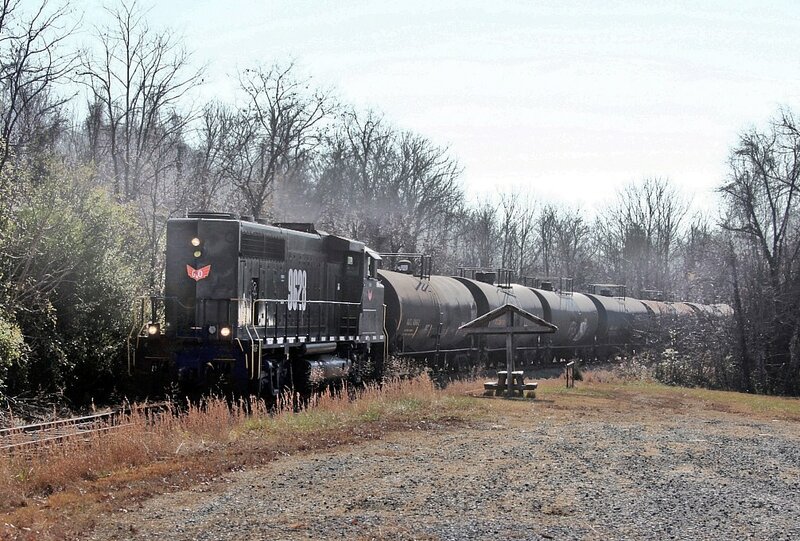 Located in the region between Crutchfield and Burch are two storage sidings adjacent to the mainline. Visually, they appear odd to the eye because of no surrounding structures and a location flanked by farmland. They are strategically located, however, as they are double ended for car storage and for locomotives to run around cuts of cars for nearby shippers. The Yadkin River valley--not unlike other mountain region valleys--is fog prone. Here is another YV1 moving westbound at Burch on an early morning. Image by Clint Renegar. 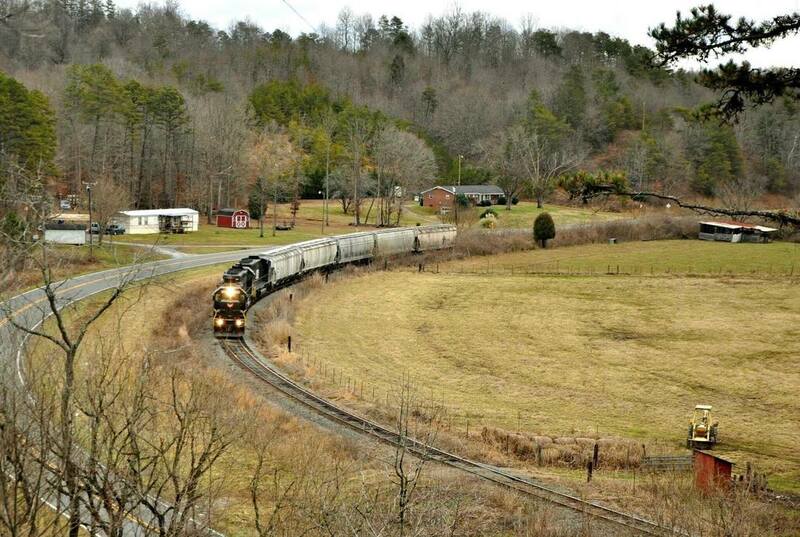 Located at the confluence of the Mitchell and Yadkin Rivers, the small community of Burch is offers a scenic vista of the streams with the railroad passing through on a wide curve. This location also retains the often used name of Burch Station harkening to the Southern Railway era when a depot was located here. 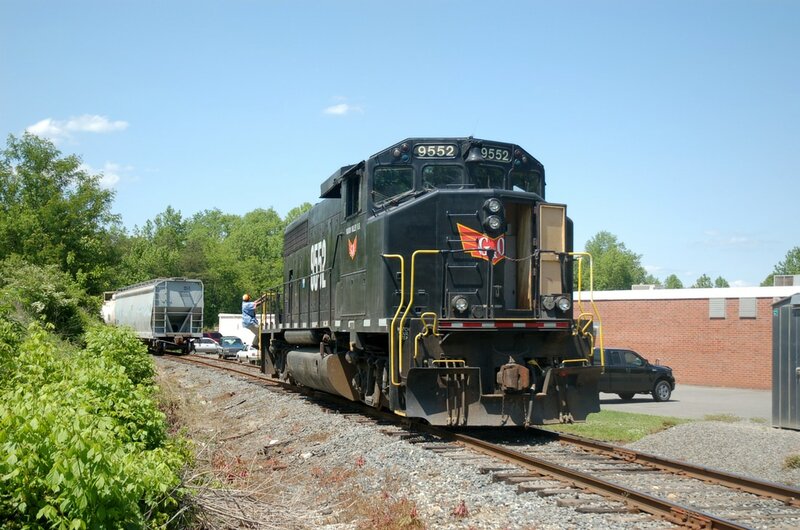 Though small, Burch does provide a shipping point for the Yadkin Valley Railroad with the presence of Wayne Feeds and Perdue Farms. 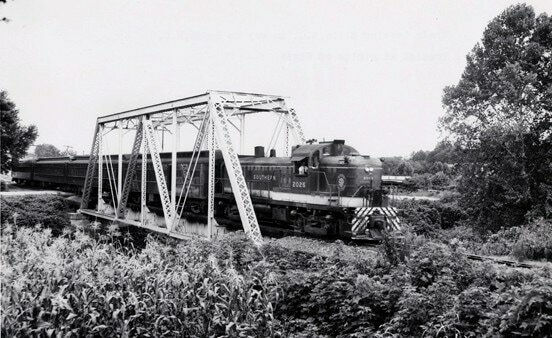 In a photo befitting a calendar, eastbound YV2 crosses the Mitchell River bridge as it approaches Burch. 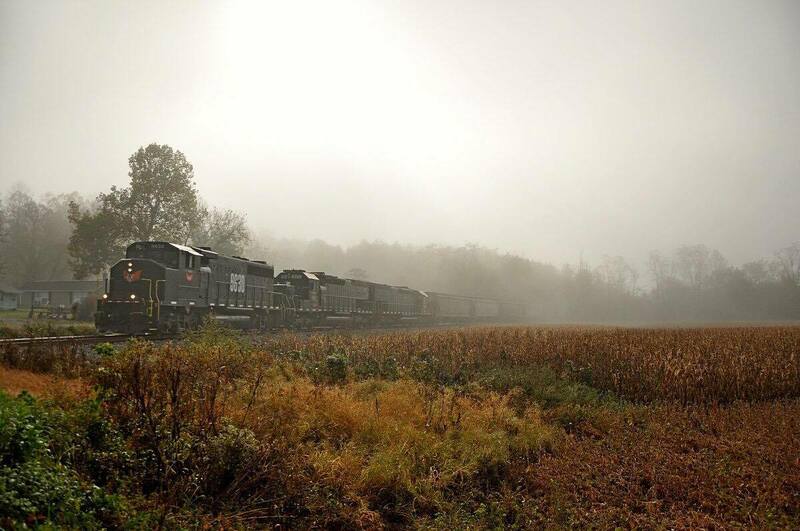 SD40-2 #6004 leads this train on its return to Rural Hall. Image by Clint Renegar. It was during the era of the French and Indian War of the 1750s that the region of what would become Elkin was settled. Early industry in the form of an iron works was established along the banks of Elkin Creek in 1776 marking the first documented example of industrial development. The region continued to grow with inhabitants but it was not until the 1840s that the framework for Elkin began in earnest. In 1840 Richard Gwyn, recognized as the founding father of the community, constructed a grist mill along Elkin Creek. Growth continued during the antebellum period but was interrupted during the Civil War. 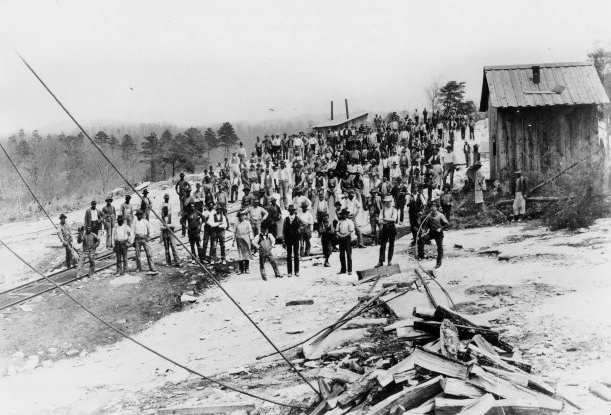 The Stoneman's Raid by the Union Army passed through Elkin in 1865 as it wreaked havoc and destruction throughout western North Carolina and neighboring Virginia. 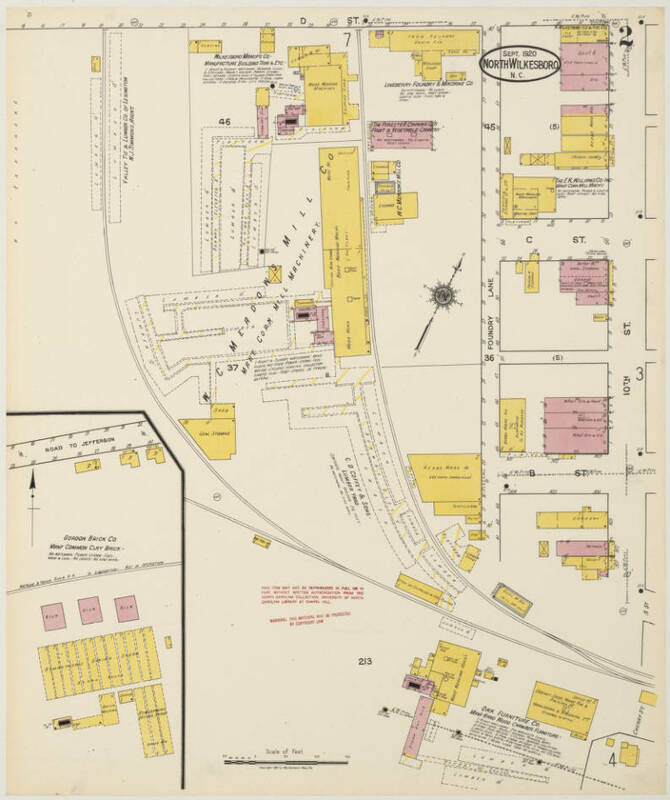 Blocked diagram of other 1915 Elkin industries. 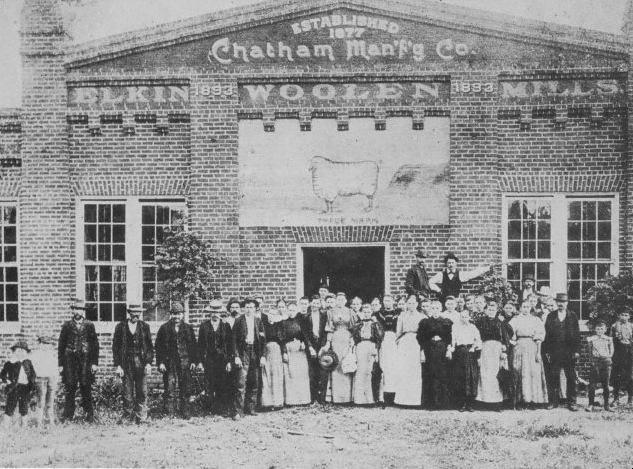 Depicted are the Chatham Manufacturing Company, Elkin Furniture Company, and the Elkin Veneer Manufacturing Company. 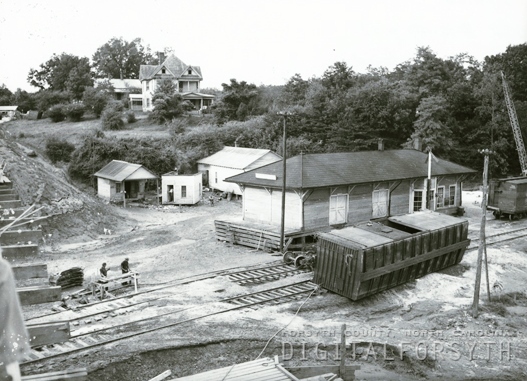 Below: A second railroad entered the scene at Elkin by 1911. The Elkin and Alleghany Railroad was built with the intention of connecting the Northwest North Carolina Railroad in Elkin to the Norfolk and Western Railway at Jefferson. In reality, Roaring Gap was as far as it reached. Image Surry County Historical Society. After the war, Elkin began to expand with the addition of new industry. In 1877, the Elkin Valley Woolen Mills was constructed and this business became the signature industry at Elkin for many years. By 1890, the company fell under the sole ownership of Alexander Chatham and renamed the Chatham Manufacturing Company. His firm gained notoriety as one of the largest blanket manufacturing businesses in the world and troops in both World Wars carried with them blankets made at Elkin. 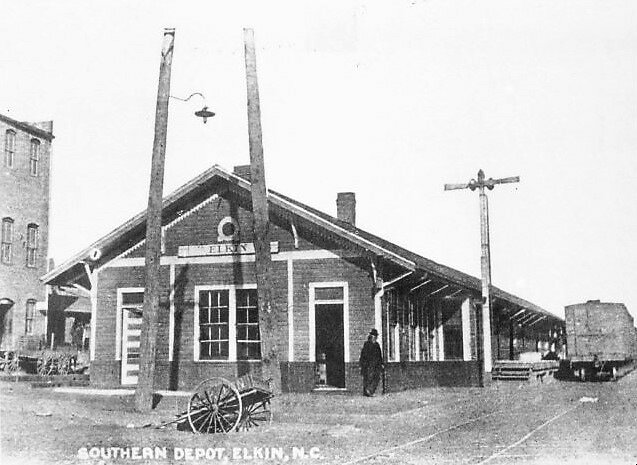 Elkin was incorporated in 1889 and the following year, the railroad arrived. With it came additional growth in textiles, furniture making, veneer, and shoes. The Chatham Manufacturing Company relocated into a larger building adjacent to the railroad and became a primary shipper. Other companies that soon emerged by the railroad were the Elkin Furniture Company and the Elkin Veneer and Manufacturing Company. 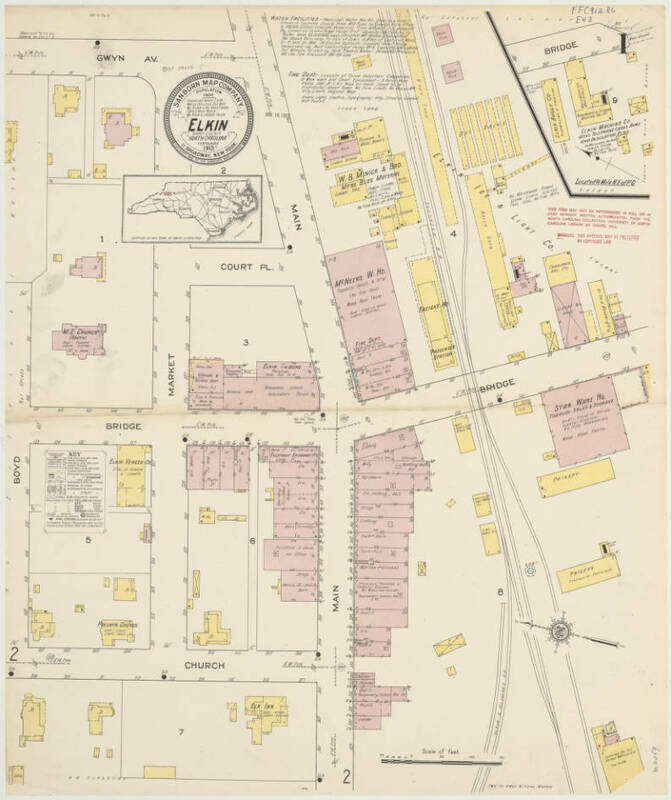 By 1915, other businesses also lined the railroad and river such as W.B Minick and Brothers Manufacturing, a stock yard, and the Elkin Light and Ice Company. 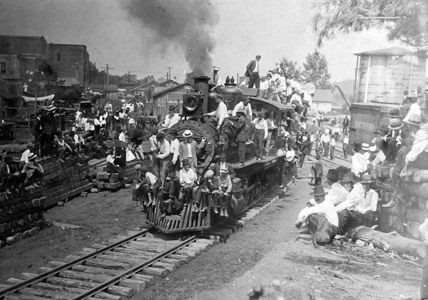 In 1911, a celebration ensued with the arrival of and connection to the Elkin and Alleghany Railroad. This short railroad was originally planned to extend to Jefferson and a connection with the Norfolk and Western Railway but never built beyond Roaring Gap. The line survived until 1931 a victim of improved highways and the automobile. Throughout the 1900s, Elkin endured commercially surviving the Great Depression and war but by the latter part of the century, the community faced the loss of industry in an expanding global economy. Contemporary Elkin has embraced its heritage and to an extent, has been rejuvenated by virtue of it. 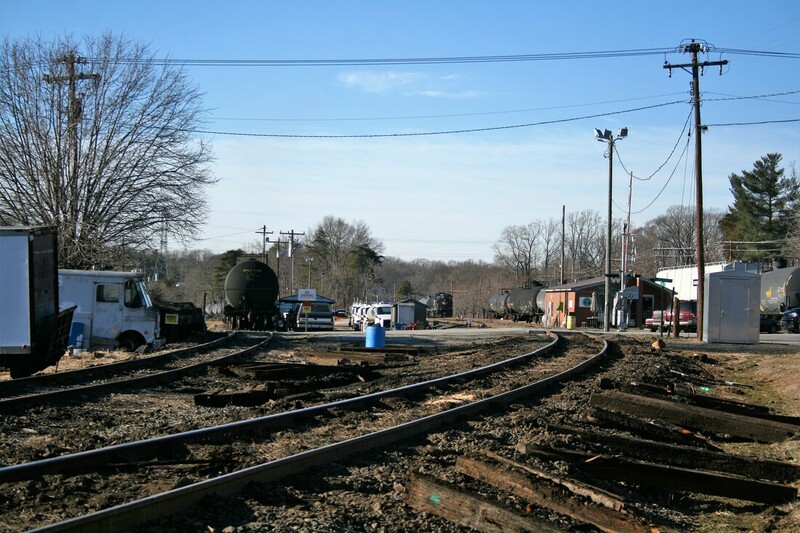 Rail traffic of the Yadkin Valley Railroad passes through daily and the town of frequently the location of switching moves and meets. Locomotives are tied down here as Elkin is in effect, a minor road terminal. Two shippers on the railroad --Weyerhauser and Candle Corporation of America-- are listed with Elkin addresses but are physically east of town. Once the rails were laid through Ronda in 1890, the town began to evolve with its new found connection to commerce. The development was rapid and by the early 1900s, the community had become a center of agriculture in the fertile Yadkin River valley. Crops such as corn, tomatoes, watermelons and wheat were grown in the expansive river bottom land and hauled to Ronda as collection point. 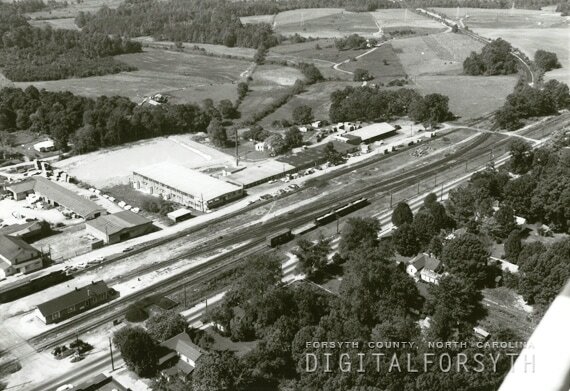 In addition to produce, the area prospered as a lumber center---the largest between Winston Salem and North Wilkesboro. Other products increasing the number of carloads were poultry, canned goods, and grain from grist mills. 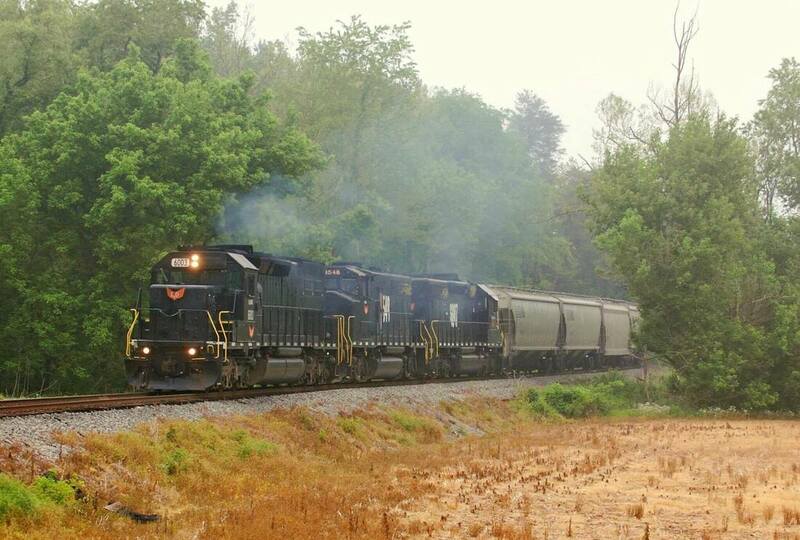 KLWX GP38M-2 #2273 and mate run light at Ronda. This is train ET1 returning eastbound to Elkin. Image by Clint Renegar. During the time of its incorporation in 1907, companies built along or in proximity to the railroad to utilize its transport. The Bridal Veil Canning Company was established in 1905 and shipped canned fruits primarily to Ohio, Kentucky, and West Virginia. In 1907, another cannery was established at Ronda, the Forester Canning Company. This firm was based in North Wilkesboro but built a separate operation at Ronda generating fifteen carloads per season. Other industries soon followed as the community grew. In 1914, the Yadkin Valley Mill and Lumber Company was established which manufactured portable grist mills, crates, boxes, and other wood based products. Also the same year witnessed the construction of the large Williams Mill Manufacturing Company that not only expanded nationally but to Africa and Australia as well. The Crescent Chemical Company was another addition to the Ronda landscape which manufactured harness and shoe oils. By the 1920s, Ronda has constructed its own independent electric power plant that served residents and industry. It remained as a solitary entity until the 1930s when Southern Utilities of Elkin purchased the plant. It was taken over by Duke Power a few years later. The last major industry to locate at Ronda during the early 20th century was a brickyard. The bricks were manufactured on site and used for both commercial and residential construction. 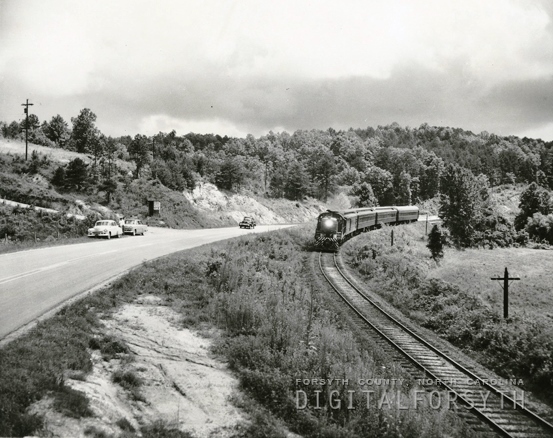 The photographer that recorded the last passenger train to North Wilkesboro in 1955 also shot these coming and going images along the line. Rural countryside in the region between Ronda and Roaring River. Images courtesy Digital Forsyth. A picturesque view of the area between Ronda and Roaring River as it appears today. A short YVRR train moves westbound through a wide curve with a cut of covered hoppers bound for Roaring River. Image courtesy Clint Renegar. The community generated traffic for the Southern Railway for many years despite periodic setbacks and economic conditions. 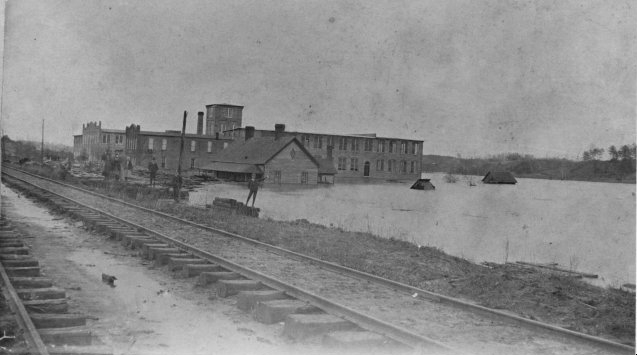 The Yadkin Valley floods of 1916 and 1940 were devastating to residents and businesses alike each time forcing a rebuild. As the industrial economy transformed and later impacts from foreign goods affected commerce, the business district of Ronda was significantly smaller by the 1990s. Although there are currently no active shippers in the town today, the humming of YVRR EMD powered trains resonate through the town five days a week. The majority of documented history at Roaring River pertains to the region along its banks rather than the community that bears the same name. 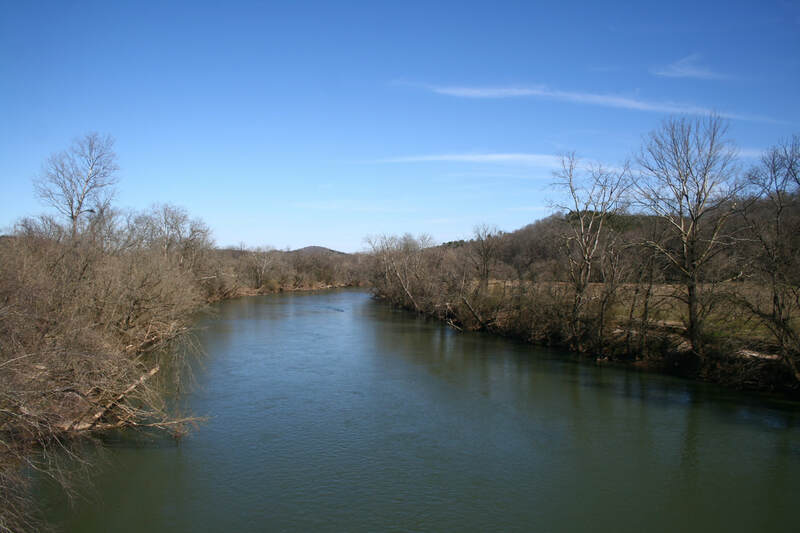 Situated at the confluence of the Roaring and Yadkin Rivers, this township lay in a wide plain along the river and for many years, agrarian in nature. It did serve, however, the people along the Roaring River and the town with a railroad depot until the end of the passenger train era. 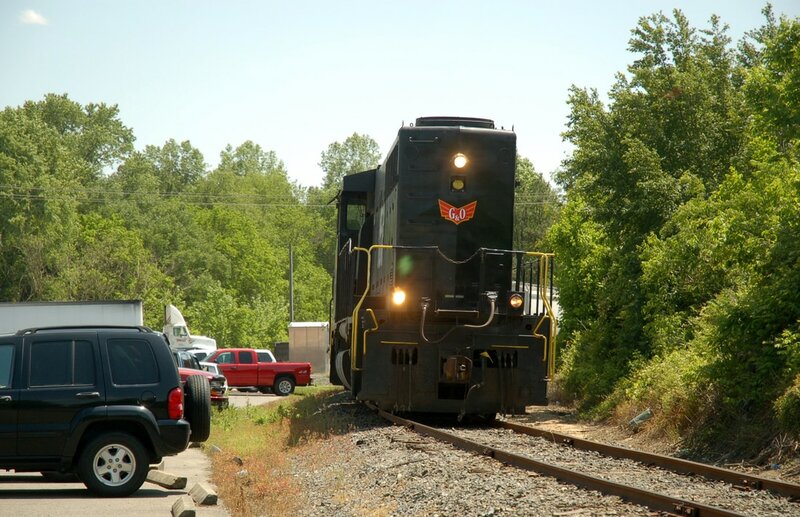 Once only a small community along the railroad, the area around Roaring River is now the backbone of the Yadkin Valley Railroad in terms of traffic volume. 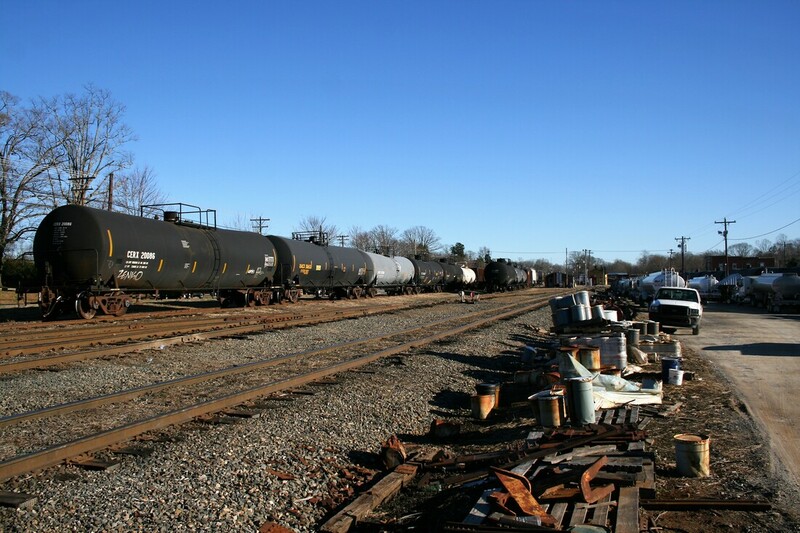 Three large industries are located here that comprise the majority of traffic for the railroad---Louisiana Pacific, Tyson Foods, and Plycem USA which also retains a siding here. Because of volume and its location at the end of the active line, trains YV1 and ET1 will frequently meet here. Beyond Roaring River to the west, the railroad uses the track that extended to North Wilkesboro for building unit trains and car storage. The territory between Roaring River and North Wilkesboro marking the end of the active line. At upper right is the westernmost point that rail cars are stored when needed. West of here the railroad moving into North Wilkesboro is intact but out of service and overgrown in numerous locations. 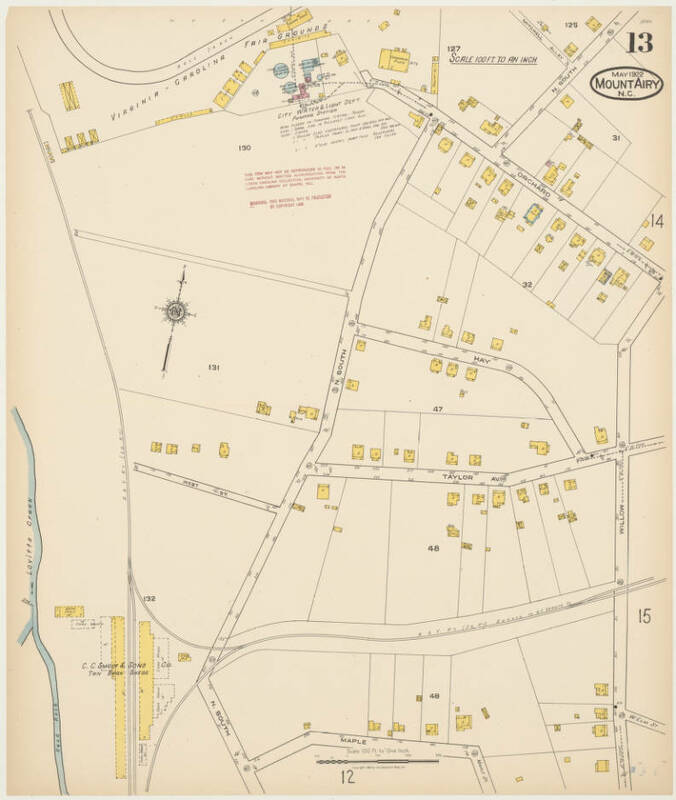 The city of North Wilkesboro can literally lay claim to the fact that the coming of the railroad placed it on the map. In anticipation of its arrival, the town was surveyed and lots along with streets were laid. Other infrastructure such as paving and the construction of bridges and buildings followed. 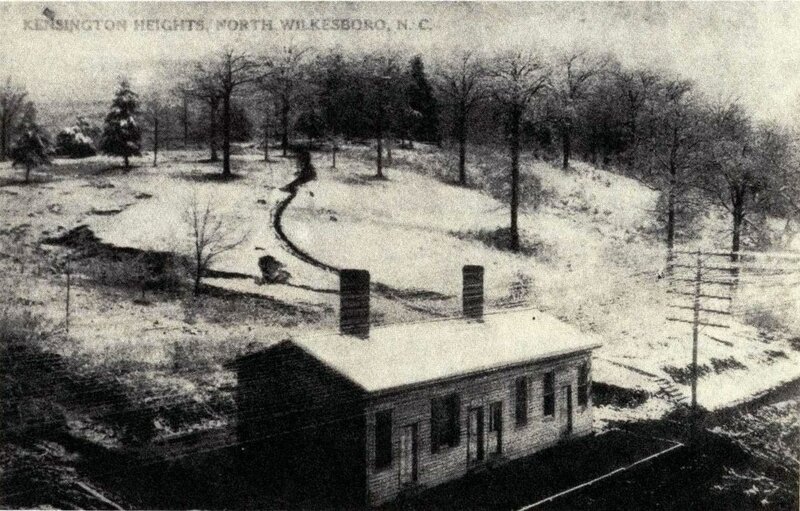 Within a year of the Northwest North Carolina Railroad establishment in the town, North Wilkesboro officially incorporated in March 1891. 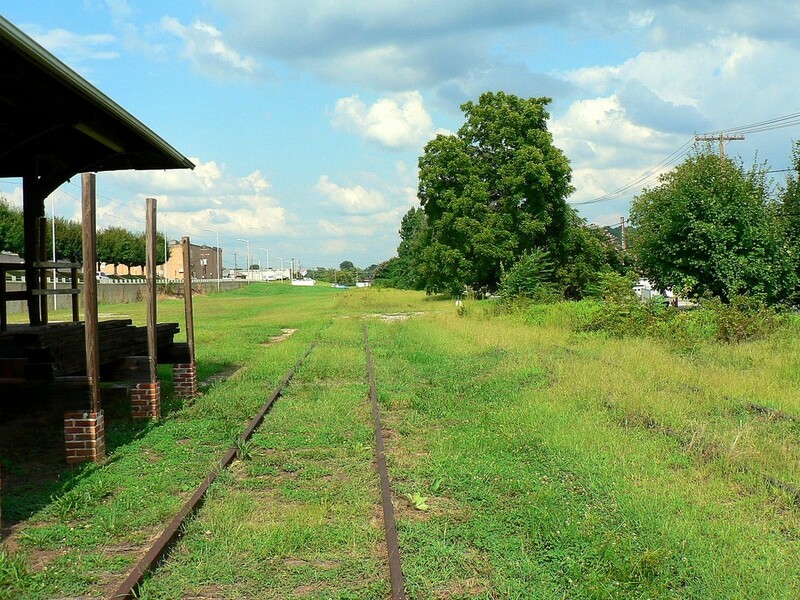 It is interesting to note that during the creation in 1890, the town signed an agreement with the Richmond and Danville Railroad Company (suitor of the Northwest North Carolina Railroad) worth $100,000 for a land grant to the railroad in exchange for stock. 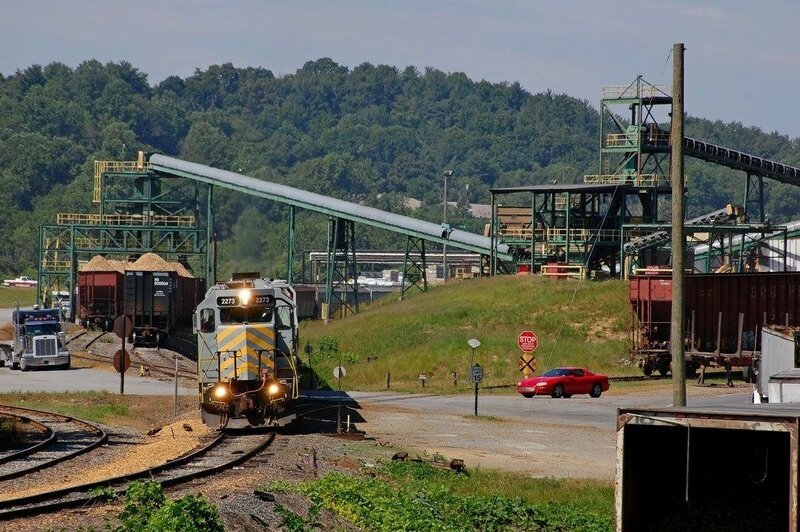 Within a few years, the Richmond and Danville Railroad filed bankruptcy and North Wilkesboro never received a return on its investment. 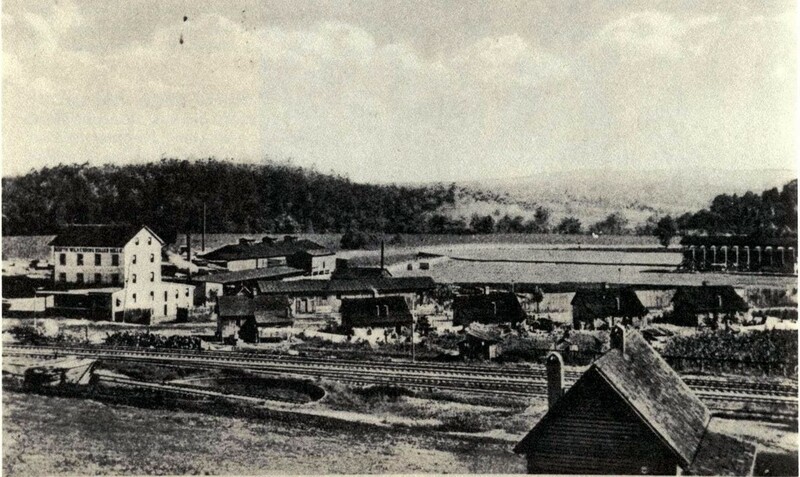 A concentration of industry at North Wilkesboro in 1920. 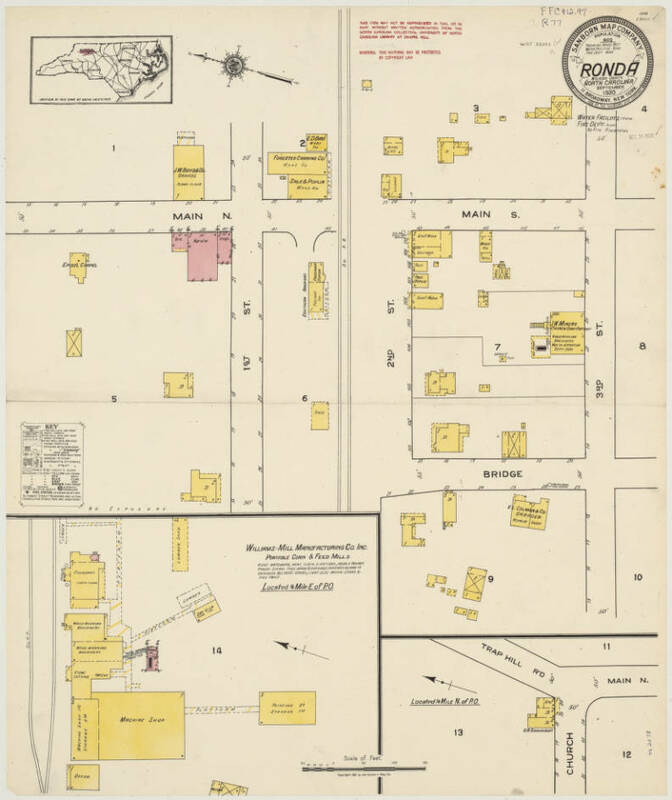 The large W.C Meadows Company, Wilkesboro Manufacturing Company, Forester Canning Company, Valley Tie and Lumber Company of Lexington, Lineberry Foundry and Machine Company, and the C.D. Coffey and Sons Lumber all packed into this area parcel. The Walnut Street area included small lumber yards with sheds. Large shippers in this sector were the Home Chair Company, W. J Palmer Manufacturing Company, and the New Williams Grist Mill. 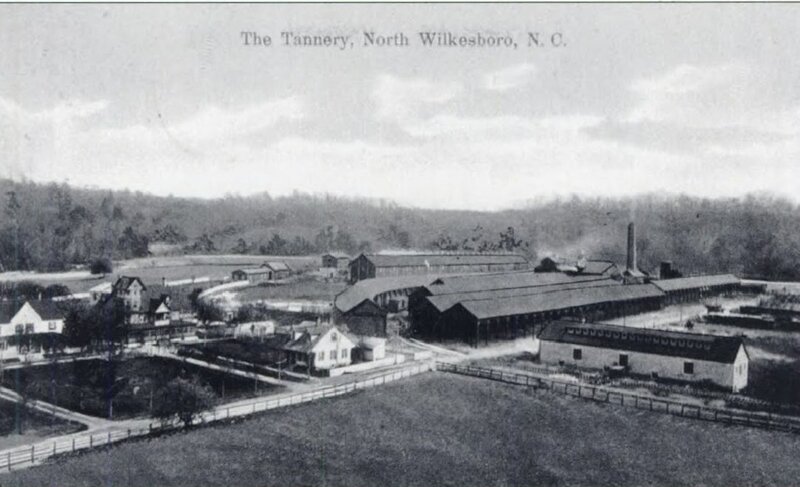 Located on Vance Street was the massive Wilkesboro Tannery. Served by two rail spurs to handle the separate facilities within the complex. 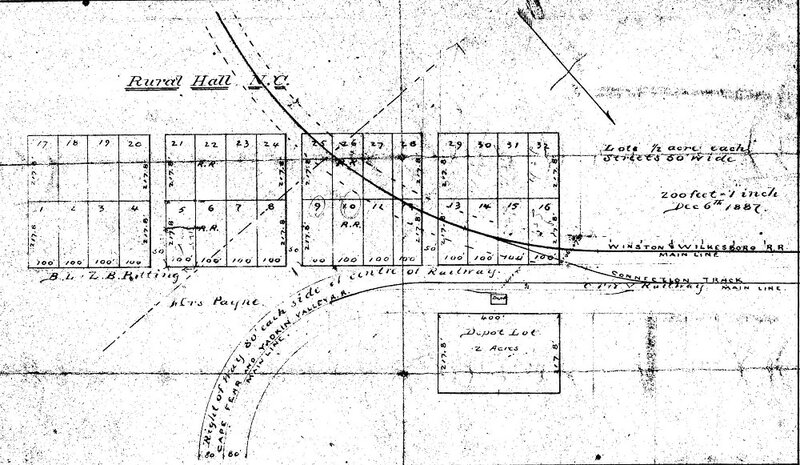 Originally, the building of the railroad from Winston Salem was to follow a due east route with the agreement that the track would be within a mile of the court house. 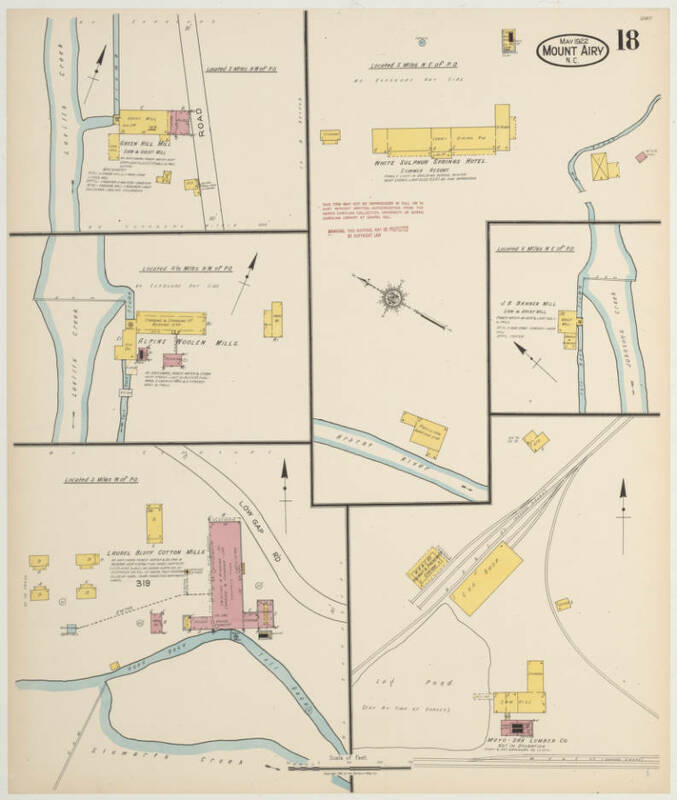 However, the actual construction pursued a northeast direction following the north bank of the Yadkin River and entered town from that sector but managed to satisfy the town fathers with the one mile parameter. A development company, the Winston Land and Improvement Company, organized the American Home Mineral and Timber Land Company among other business ventures that capitalized on the new railroad. The new depot was originally named Gordon, then New Wilkesboro, and eventually, town leaders decided upon the name of North Wilkesboro. Businesses soon sprang up along the railroad and most notably, the C.C. Smoot Tannery, which would become the largest in the South. 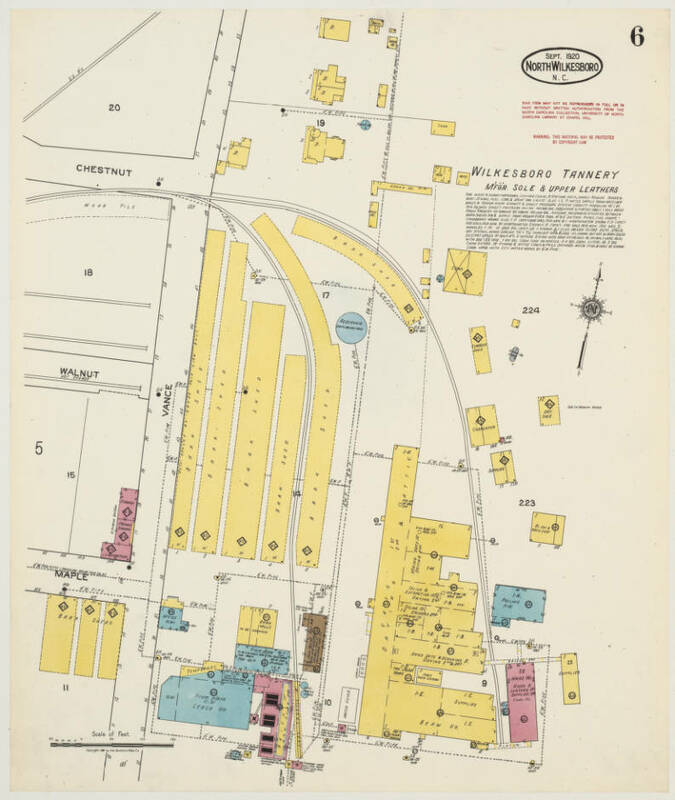 By 1920, a cluster of shippers had located around the railroad at town center dominated by the massive Wilkesboro Tannery. The Forester Cannery was established but what developed as the defining industry at North Wilkesboro was the lumber and furniture business. The list of businesses aligned with this industry is as follows: C.D Coffey and Sons Lumber, Valley Tie and Lumber Company of Lexington, P.E Brown Lumber Yard, Forest Furniture Company, and the Home Chair Company. 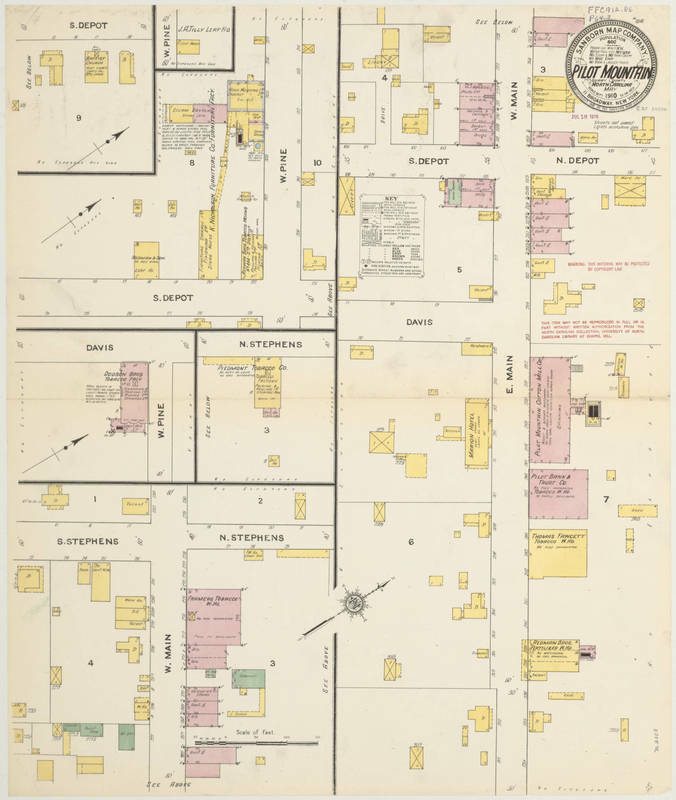 An assortment of non-lumber related businesses existed as well such as the Lineberry Foundry and Machine Company and the W.C Meadows Company. 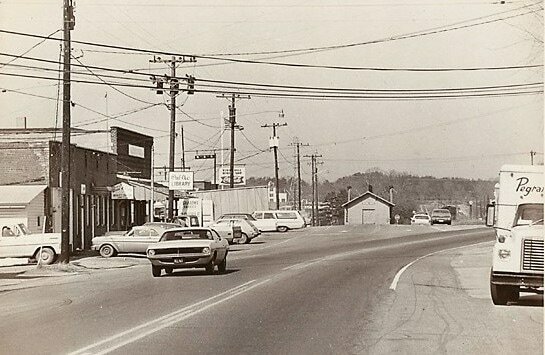 North Wilkesboro, not unlike other communities along the banks of the Yadkin, found itself rebuilding to a great extent more than once. 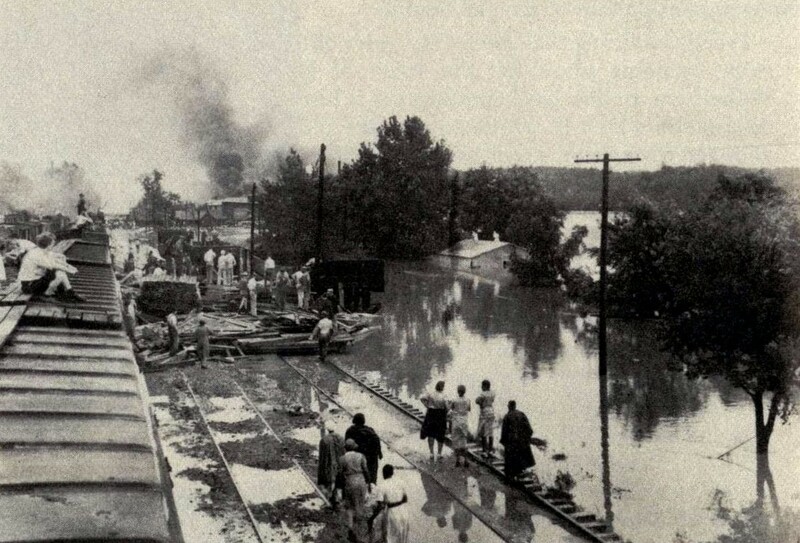 The valley was prone to flooding and the 1916 and 1940 versions were catastrophic. In addition to the toll on human life, the economies were severely damaged. A number of businesses were able to rebuild and recover from the damage. But there were also others that did not and vanished. Flood control was finally established in 1962 with the construction of the W. Kerr Scott Dam and Reservoir eliminating a repeat of these disasters. From the effects of the 1940 flood and continuing into the postwar years, the economy of the North Wilkesboro region gradually transformed. New businesses arrived on the scene such as Lowes Foods and Lowes Home Improvement Warehouses that not only operated locally but also established corporate headquarters here as well. The modern day association of North Wilkesboro with NASCAR is culturally rooted in this region although the location is no longer a stop on the racing circuit. With the passage of decades, the area began to suffer the same fate as enumerable communities across the region did--the decline of long established industries. The economic foundations of textiles and furniture manufacturing faced increasing pressure from foreign competition combined with cheap labor. With these declines came the retreat of the railroad. The last stop completed, Southern Railway RS3 #2025 prepares to depart on the deadhead return to Winston Salem. North Wilkesboro would become a freight only stop the following day. Image Digital Forsyth. Perhaps the greatest irony is that this once active city that was a prominent shipper on the route is without active rail service today. Economic shifts and downturns caused an evaporation of the business that relied upon the railroad. These former shippers either closed or relocated operations elsewhere. 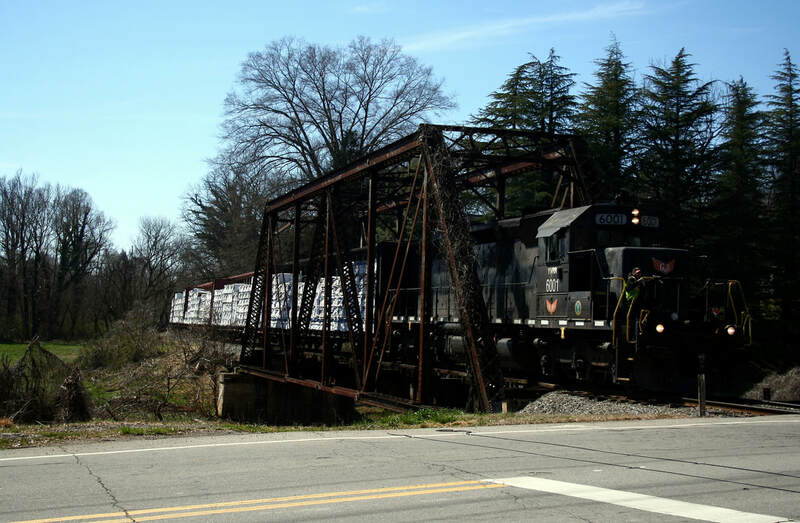 According to the Yadkin Valley Railroad, it has been at least a decade since trains last ran in the immediate North Wilkesboro area. The last active shippers were the Lowes Home Improvement warehouse and a scrap metal dealer. The railroad did state, however, that it is hopeful service will return to the city and remains optimistic for that potential. 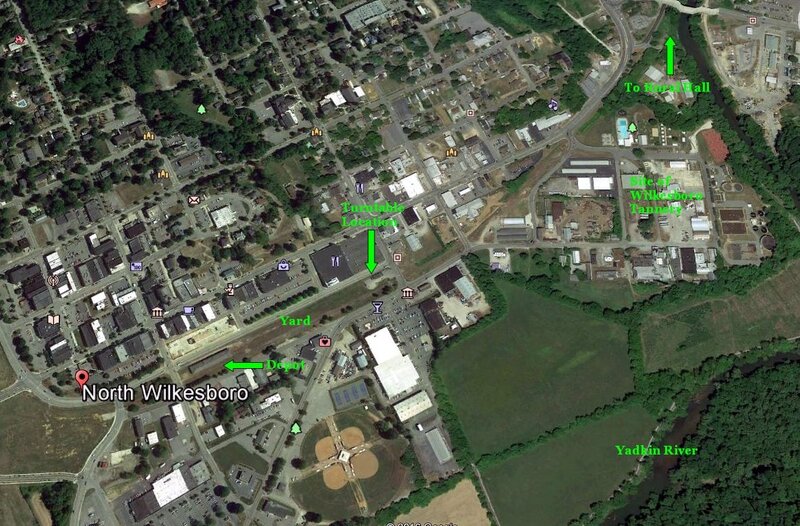 Google Earth view looking at the heart of North Wilkesboro around the railroad. 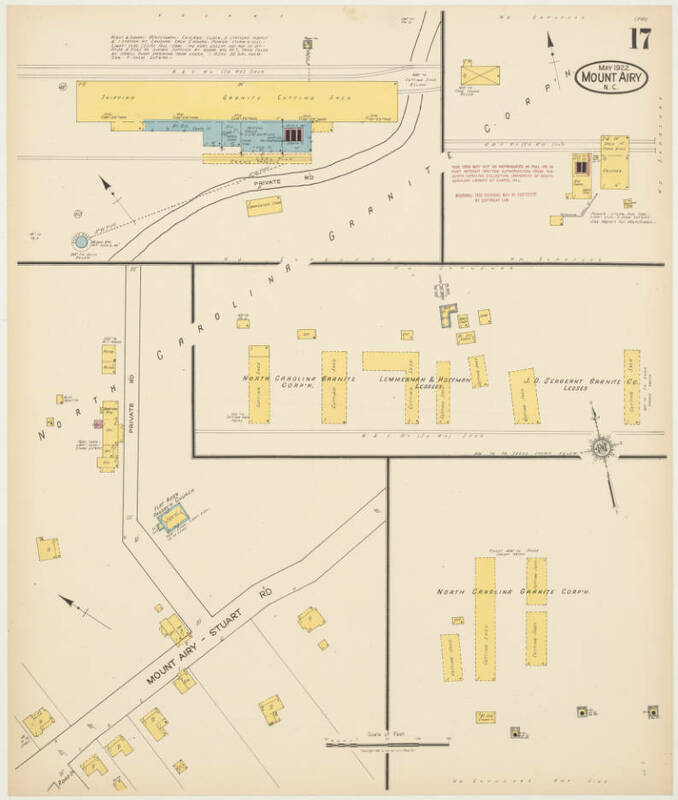 Indicated are a few landmarks such as the depot, yard, and former locations of the turntable and the large Wilkesboro Tannery. The railroad is extant here but out of service--no active shippers currently exist. The Yadkin Valley Railroad is big time railroading on a small scale. It is representative of modern operations with shippers receiving carloads in bulk yet conveyed in an atmosphere unlike its Class I big brothers. What differentiates the YVRR is the setting in which it operates--there still exists the feel of a branch line railroad from a generation or more ago. 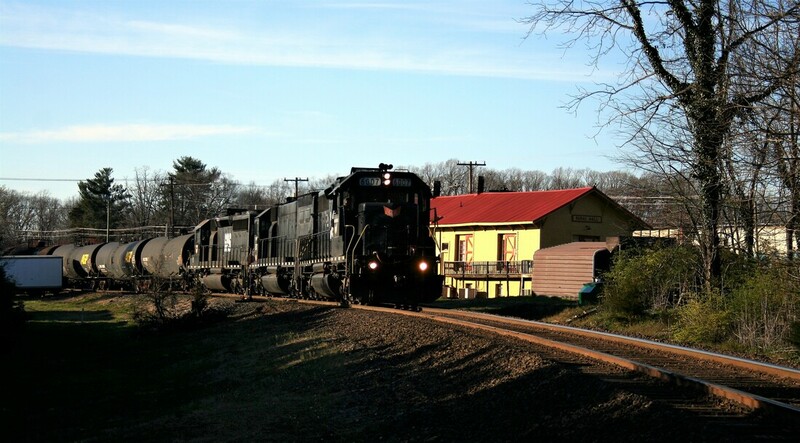 Operating in a predominately rural setting with older EMD power, the railroad is picturesque in the valleys of the Yadkin and Ararat and dotted with the small town charms of locations such as Rural Hall and Elkin. 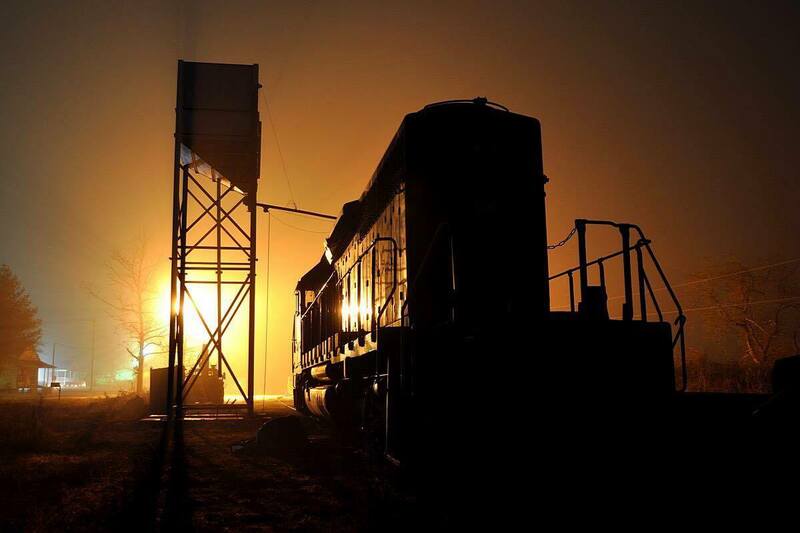 As the images on this page by Clint Renegar attest, the railroad is photogenic and for the most part, accessible. Any season is a good time to visit for a weekday outing but the fall splendor would be the pinnacle. 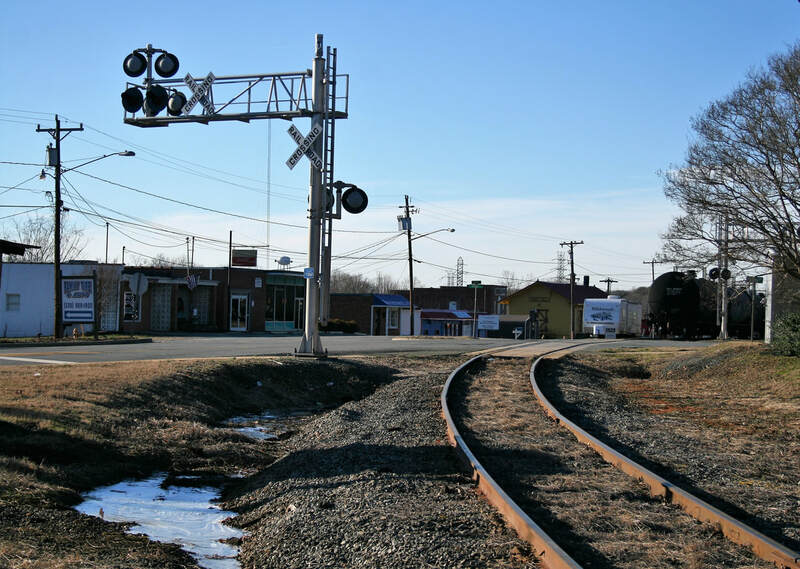 For the rail historian, time could also be spent exploring the out of service sections in Mount Airy and North Wilkesboro to analyze its lost past as well. "Brief History of North Wilkesboro"
Special acknowledgement to Clint Renegar for the wonderful gallery of photos and information about the present day Yadkin Valley Railroad.